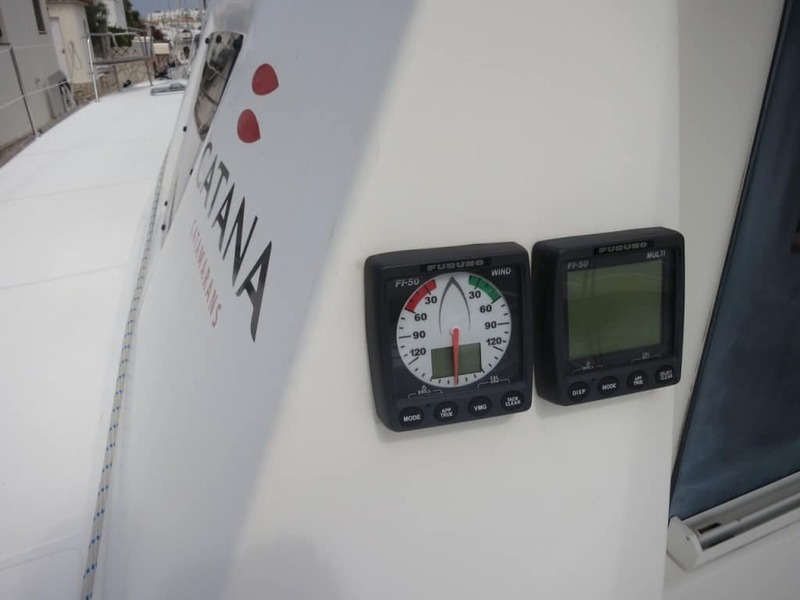 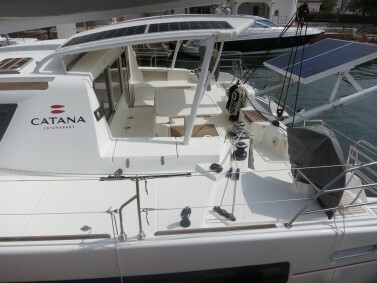 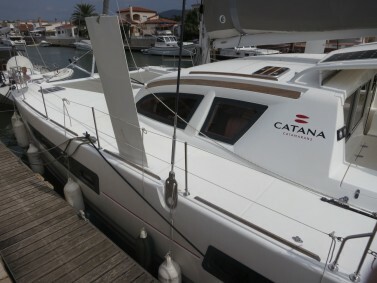 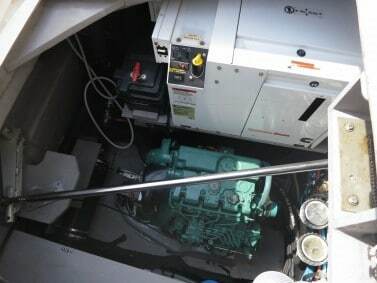 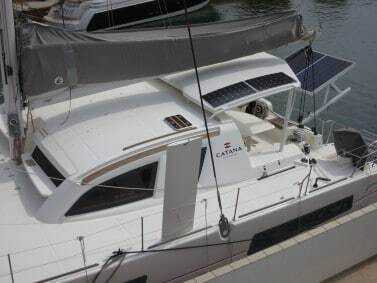 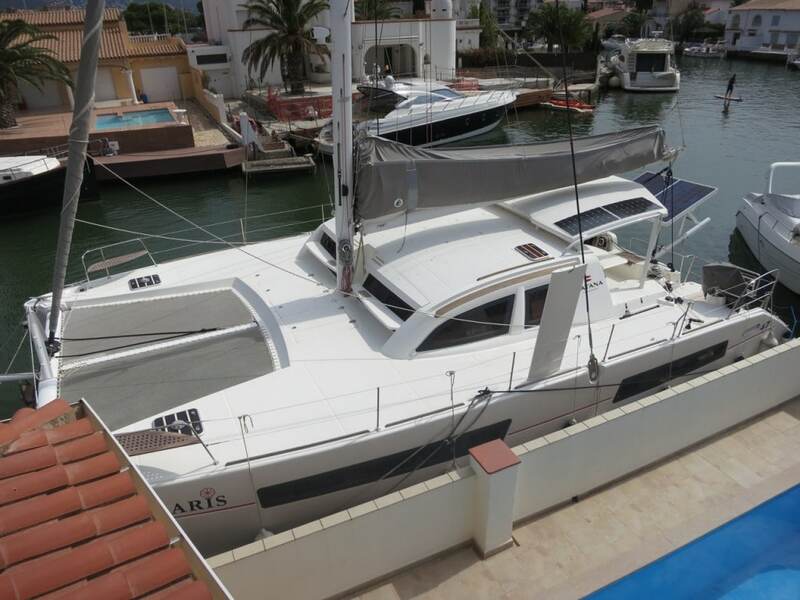 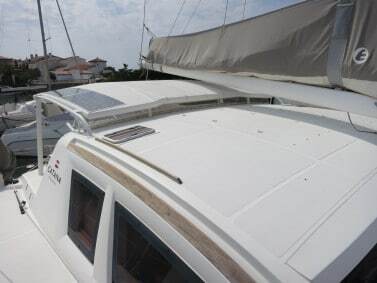 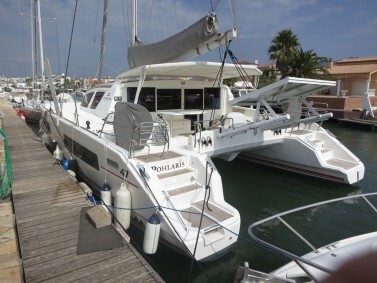 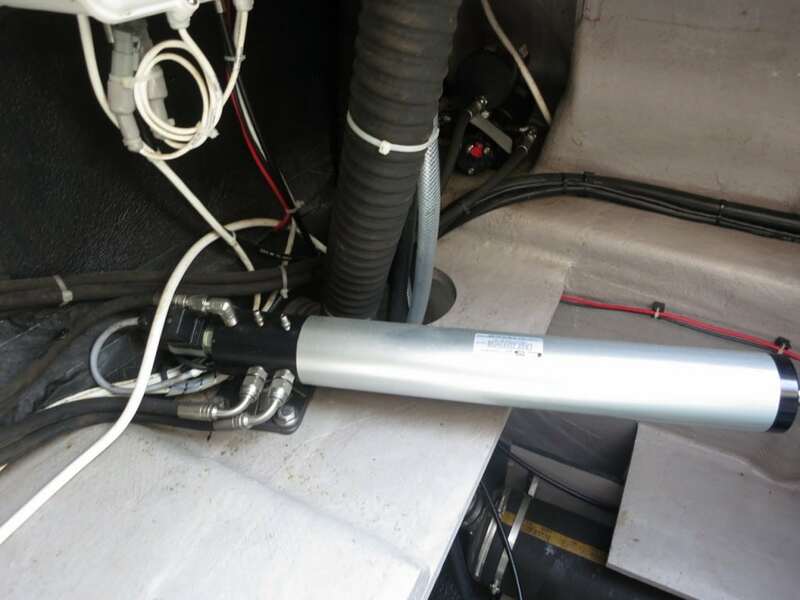 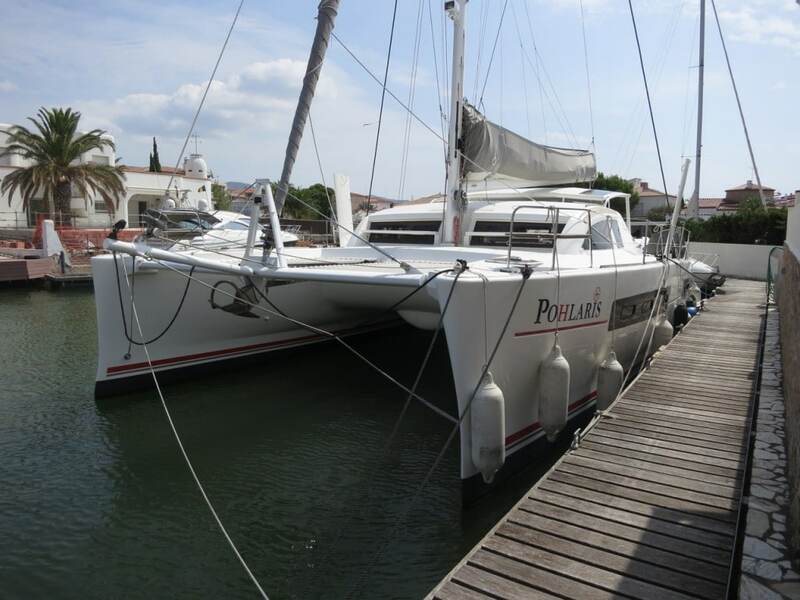 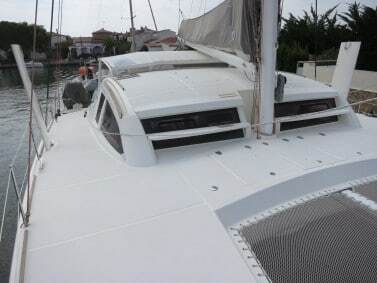 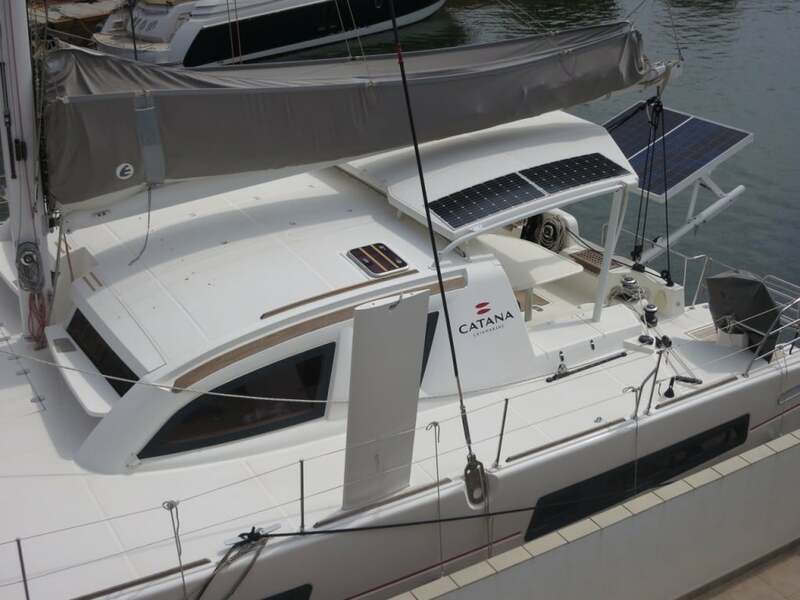 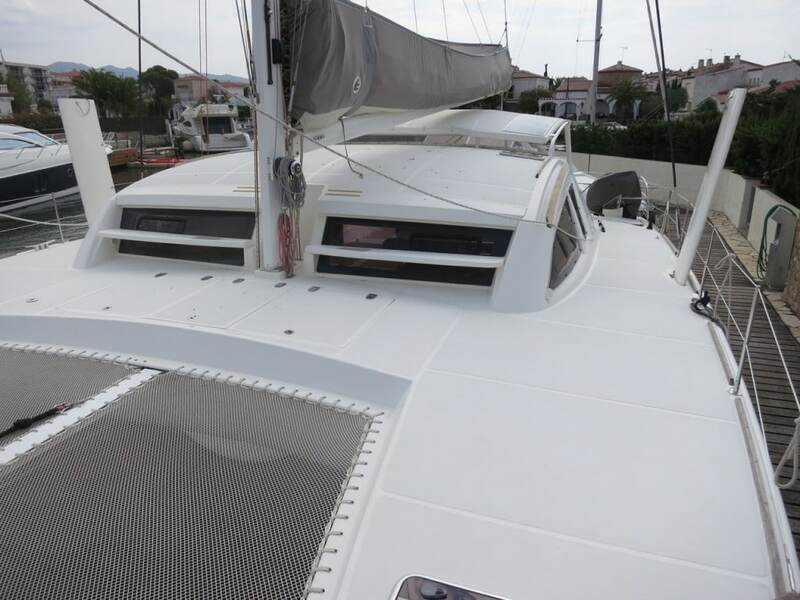 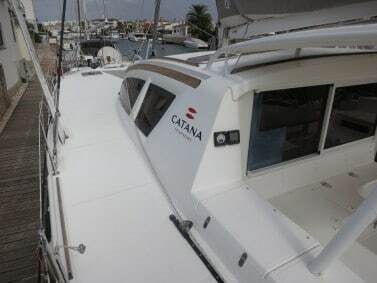 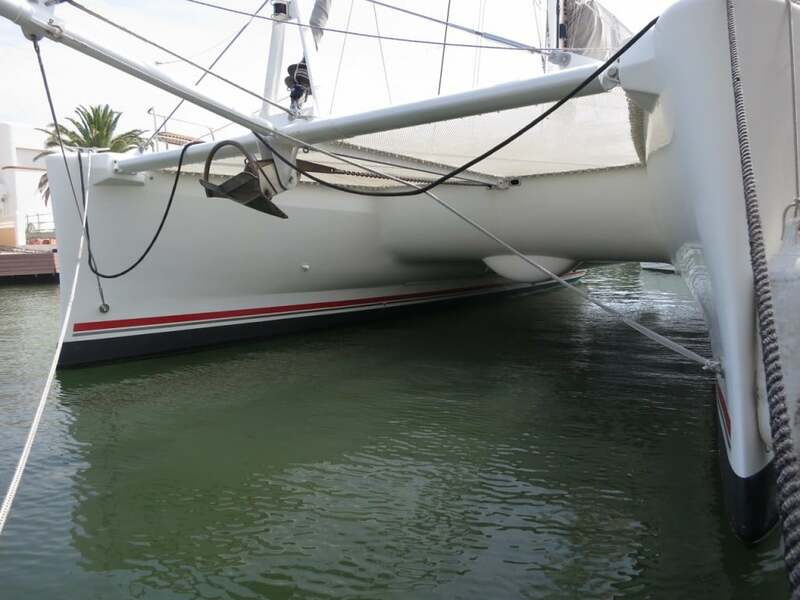 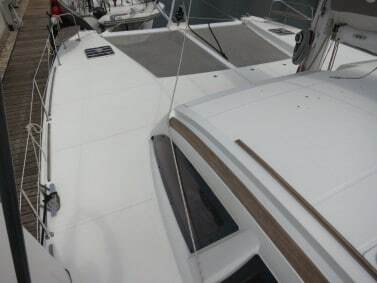 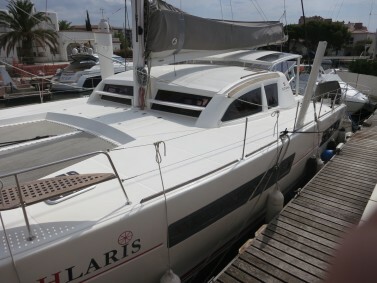 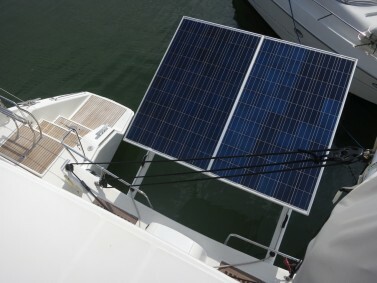 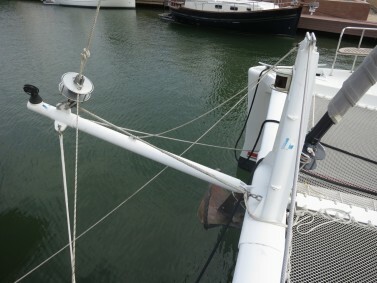 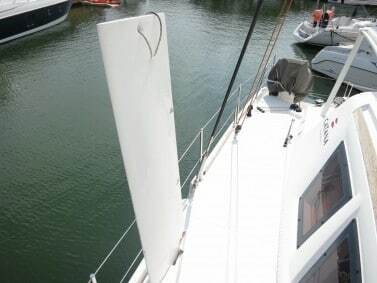 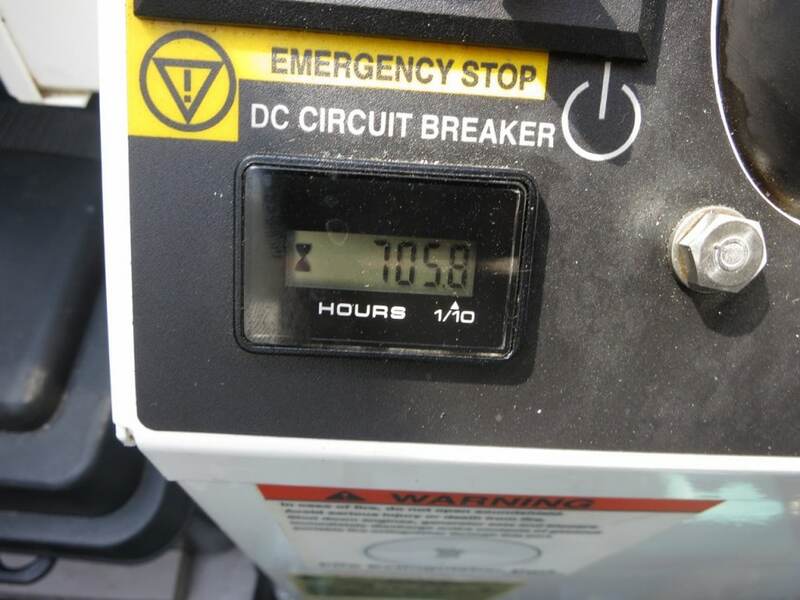 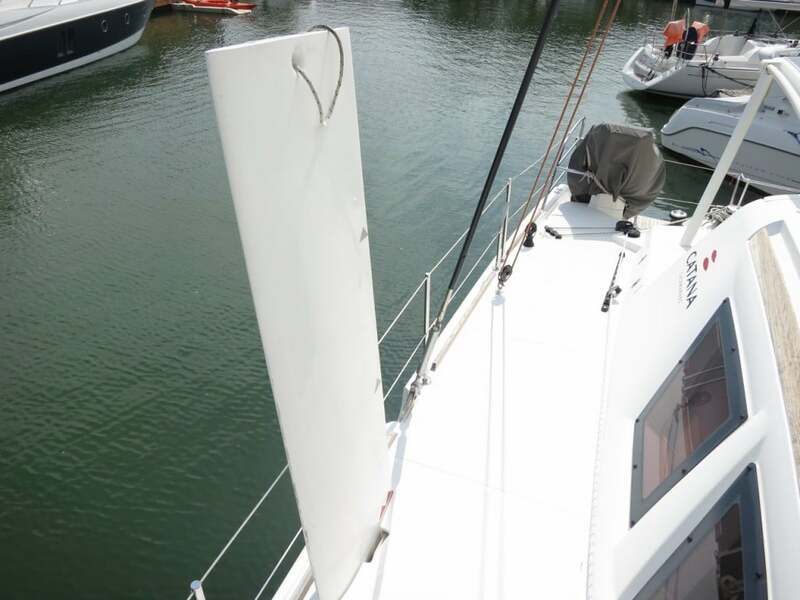 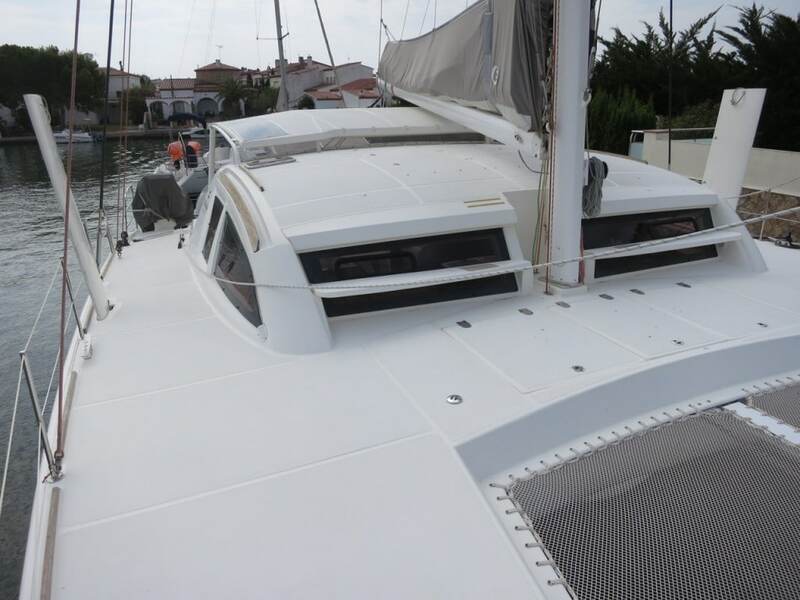 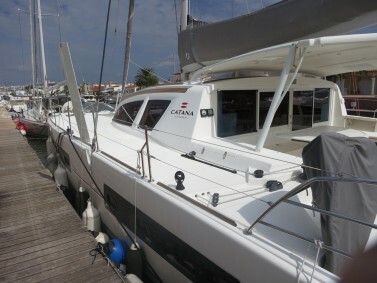 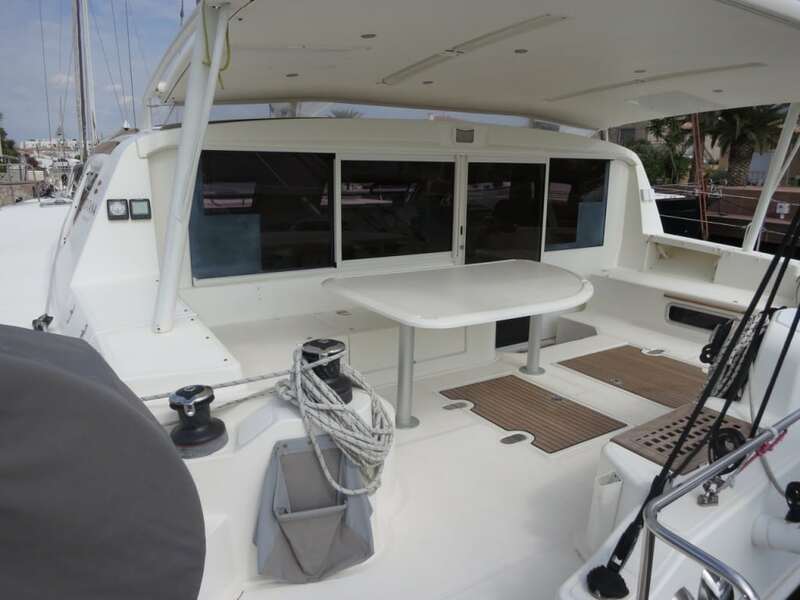 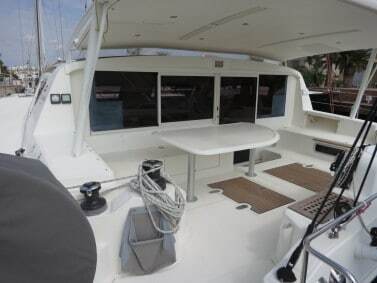 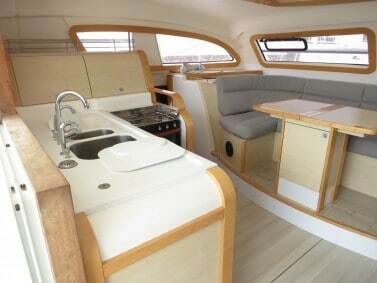 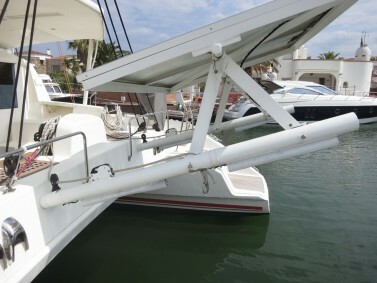 2012 Catana 47 Carbon Infusion in owner’s version. Sharp and light with a spacious and bright interior. Equipped for a world tour and ready to go. 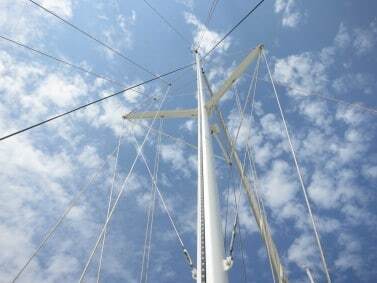 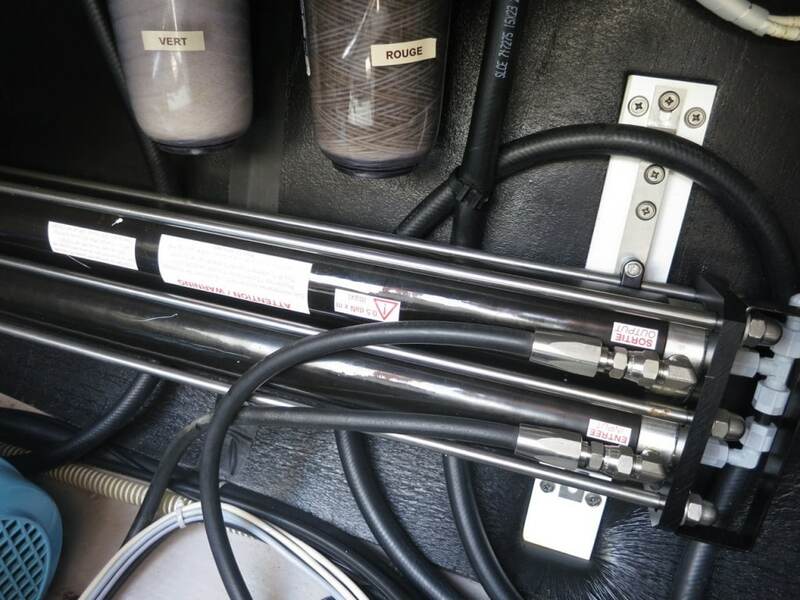 Last complete service 7/2016, including 3 layers of International Micron antifouling. 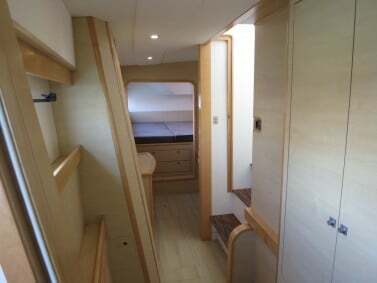 3 cabin layout, one master cabin in starboard hull and 2 cabins in the port hull, all with independent bathrooms and electric toilets. Interior finishes are superb with foam-cored satin varnished maple joinery and laminated maple trim throughout. 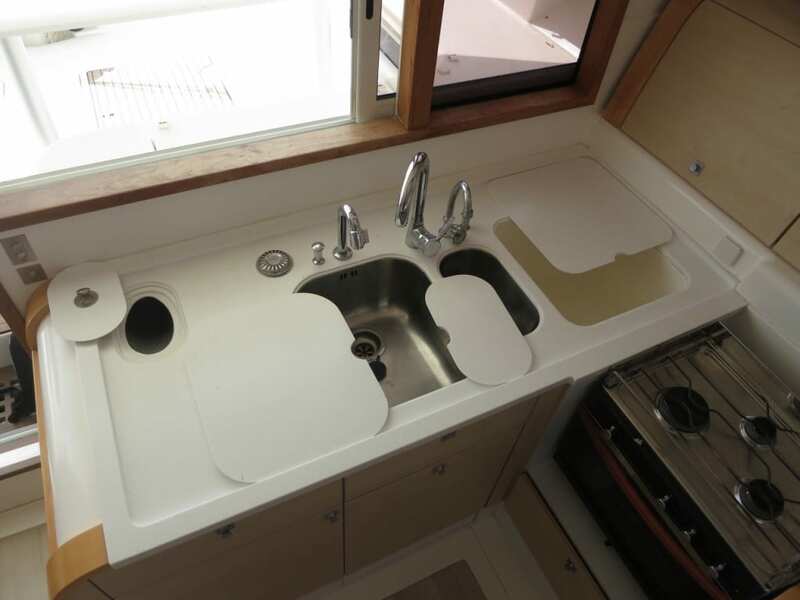 White Corian countertops in the galley and bathrooms and alcantara liners, premium quality upholstery and light oak flooring. 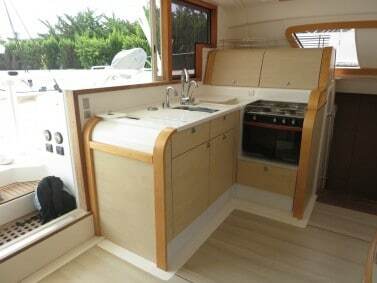 The galley interfaces extremely well with the cockpit with the intervening window sliding completely away for true inside-out living. 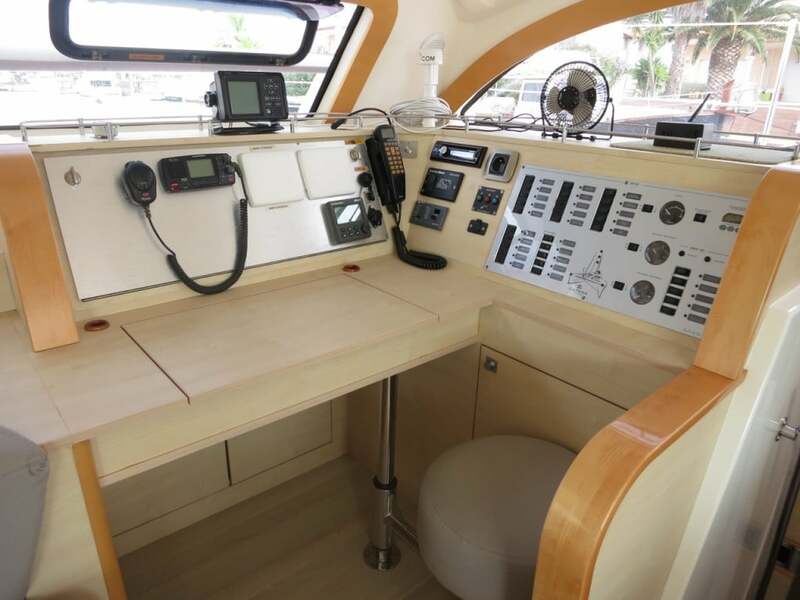 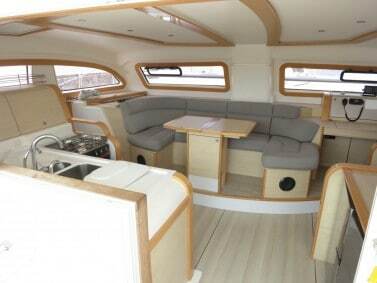 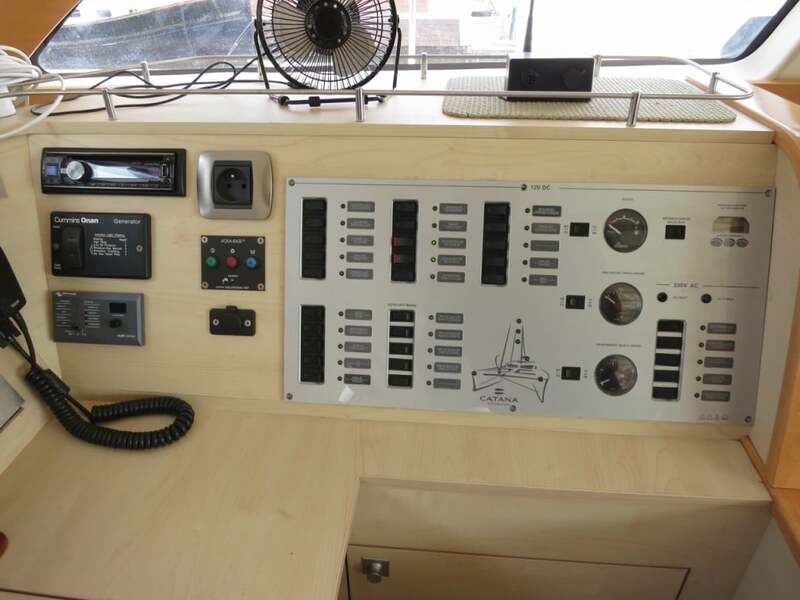 The salon settee is to forward, raised from the floor (chosen upgrade) with the navigation station rotated aft starboard to take advantage of the display area created by the expanded owner’s cabin down in the starboard hull. 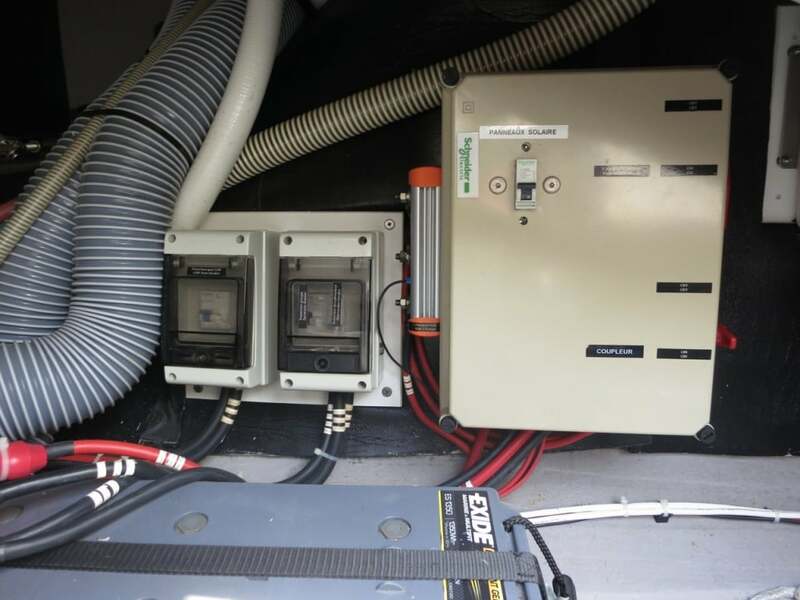 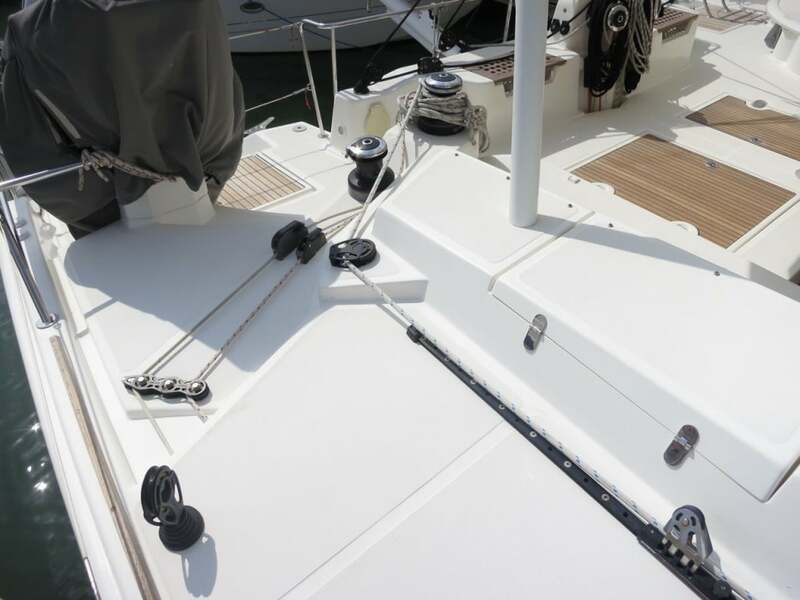 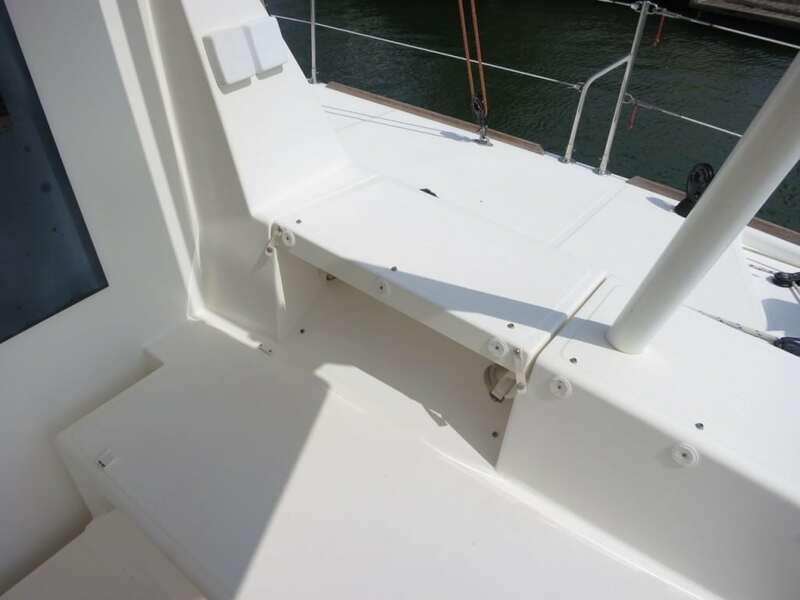 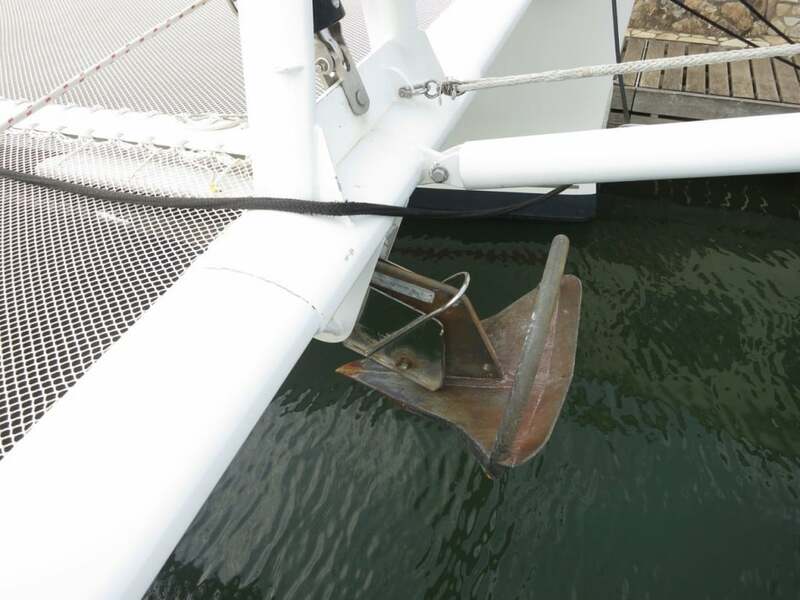 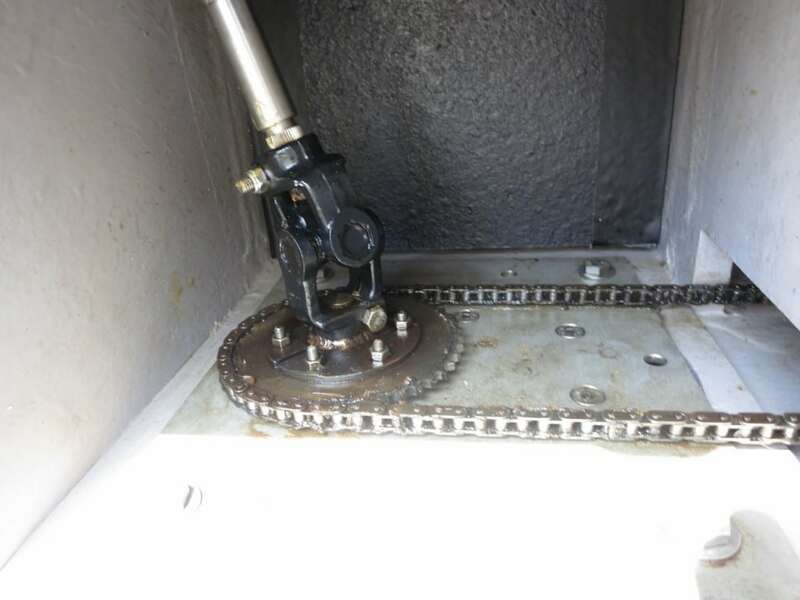 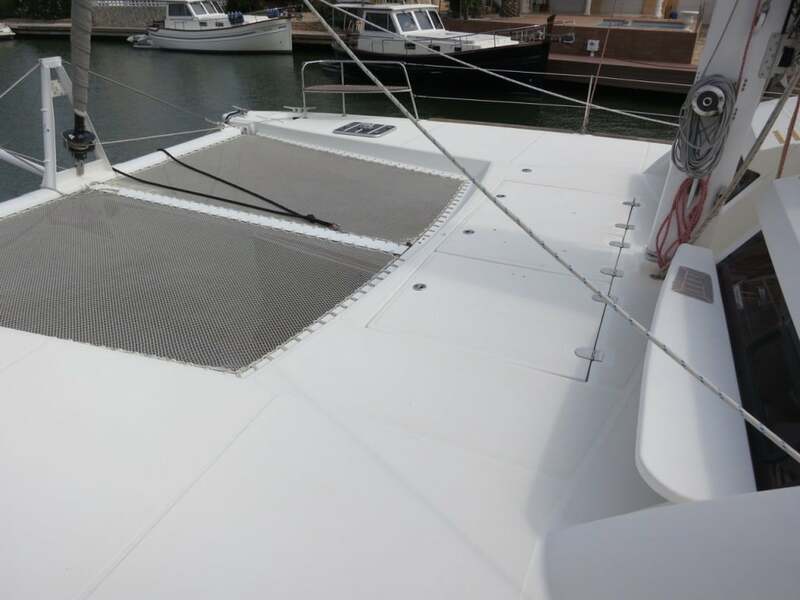 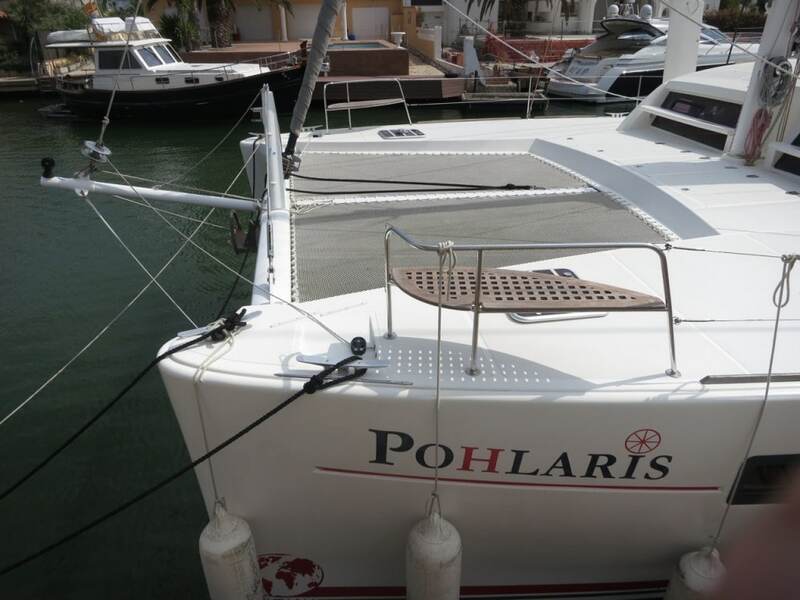 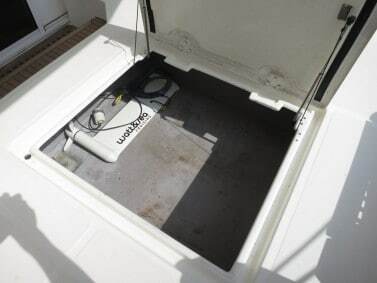 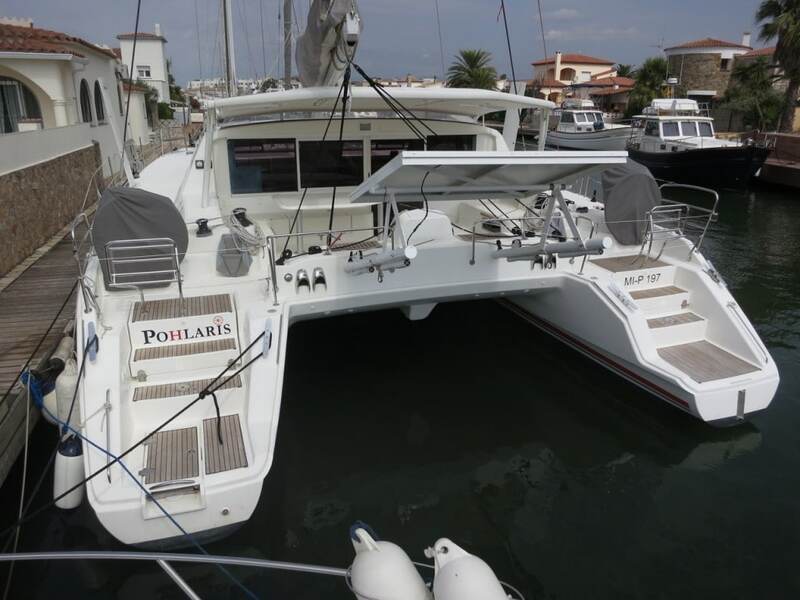 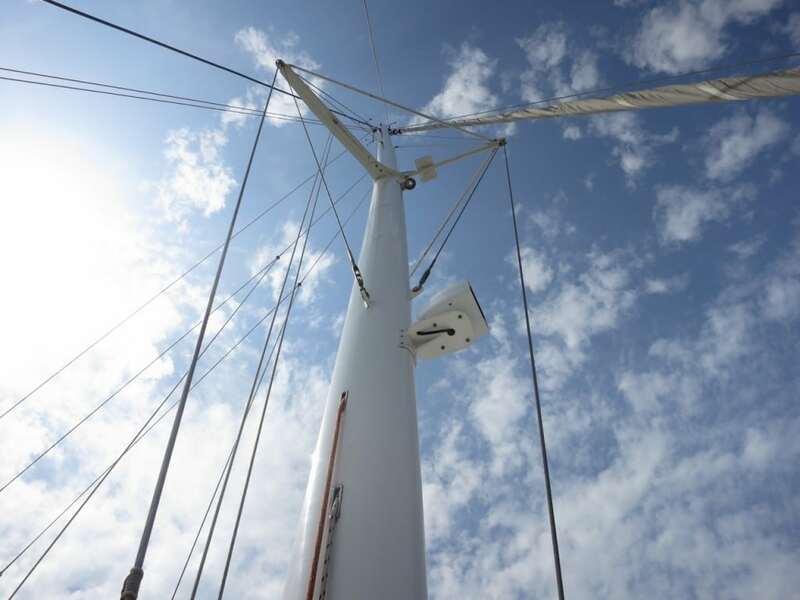 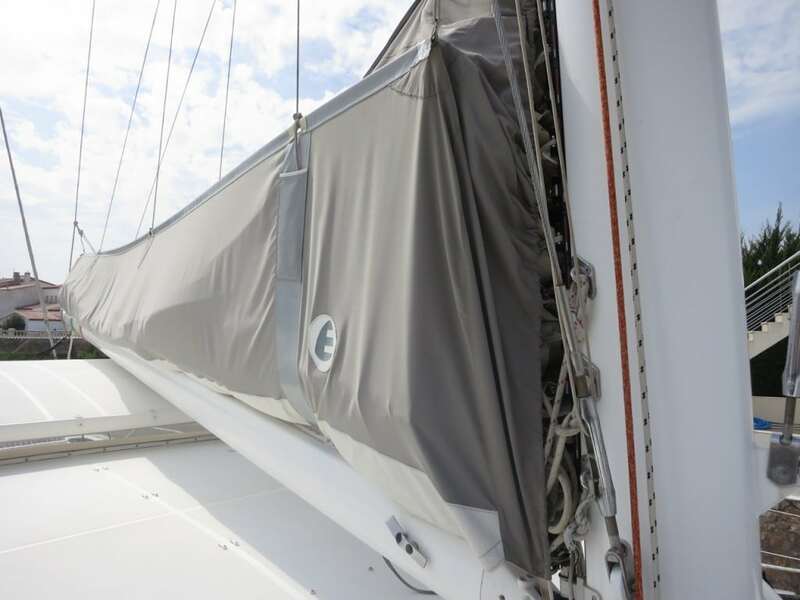 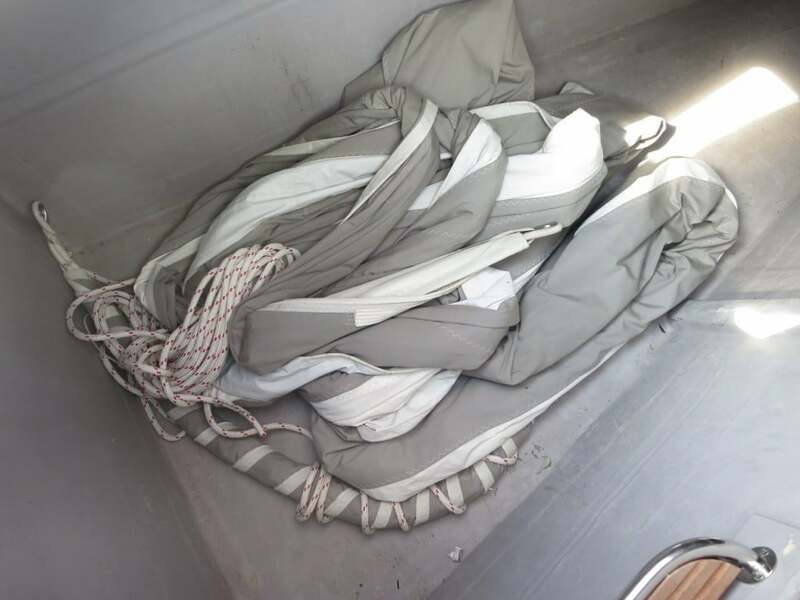 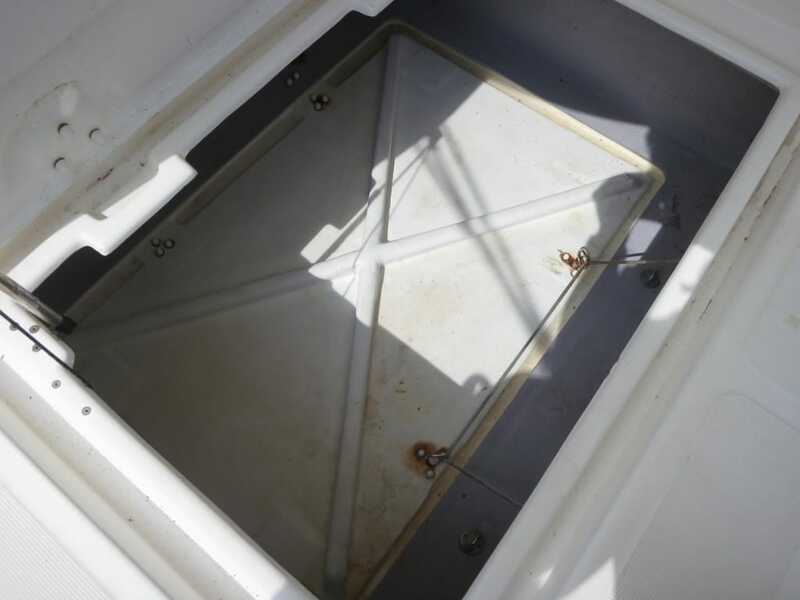 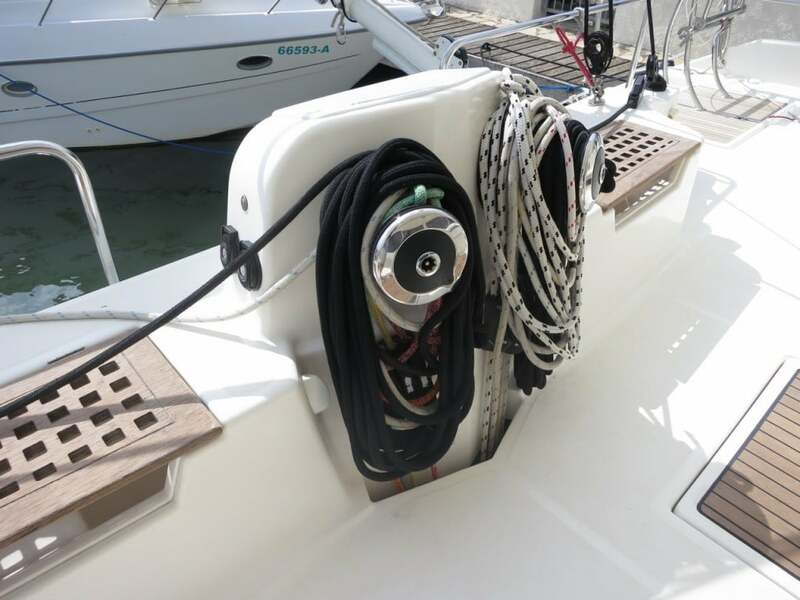 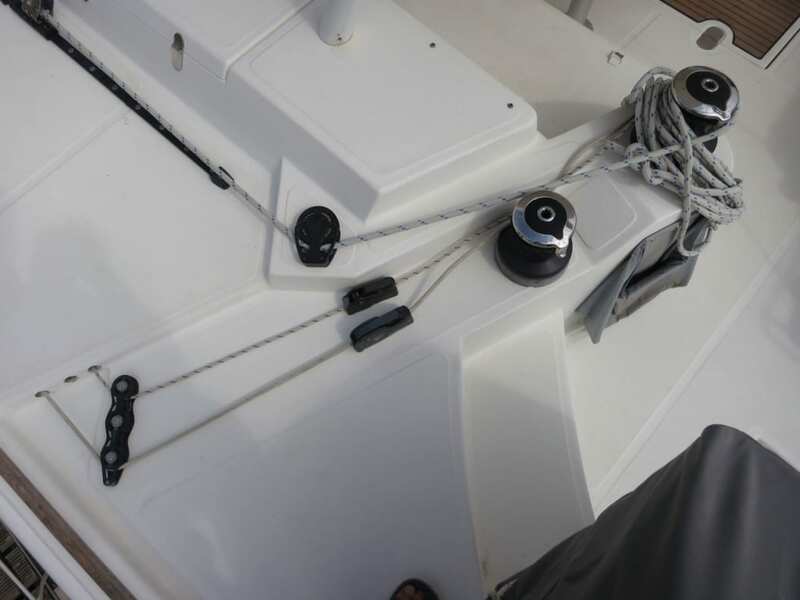 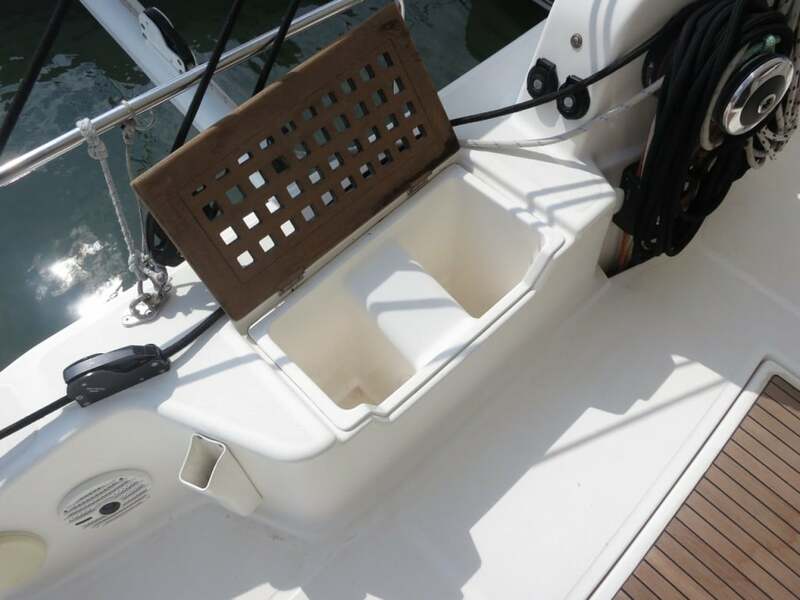 Forepeak has sail storage with access via a deck hatch. 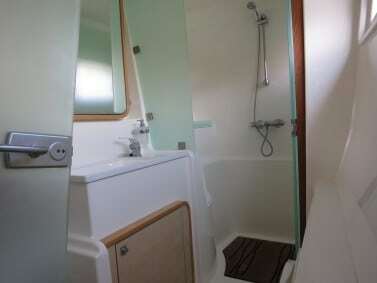 The starboard bathroom has a separated shower from the washbasin and the head. The molded shower stall is very spacious, teak floor, shower drain pump, and a separation door. 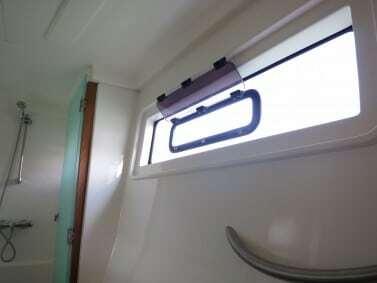 There is a large “sea-view” portlight outboard with built-in mosquito screen/sun shade. 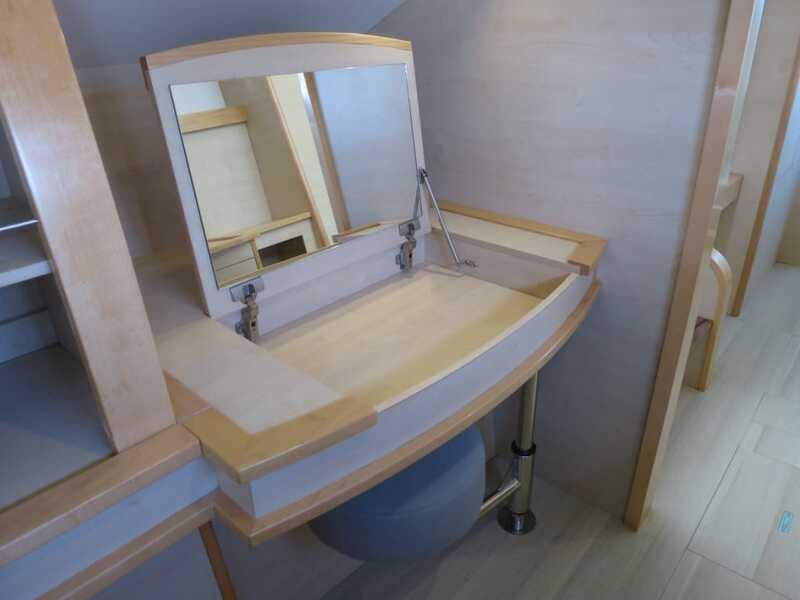 Aft of the shower compartment is a molded vanity with Corian countertop. Hot/cold pressure water and medicine cabinet. There is an escape hatch inboard with mosquito screen/sun shade. 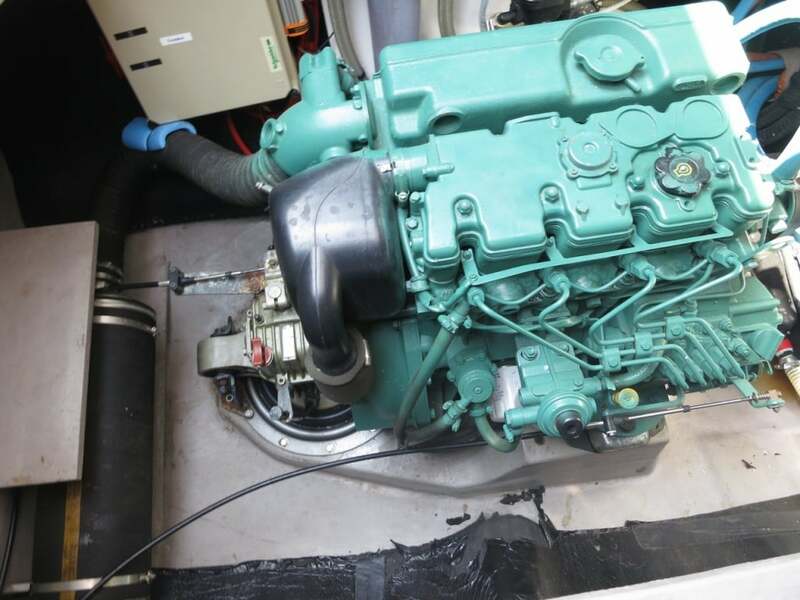 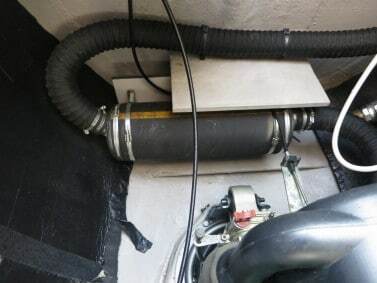 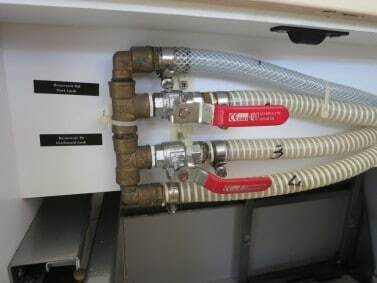 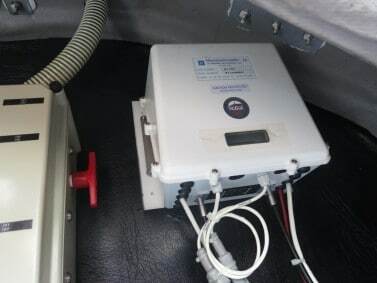 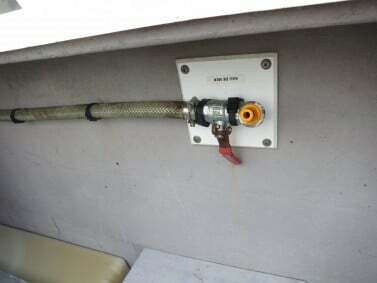 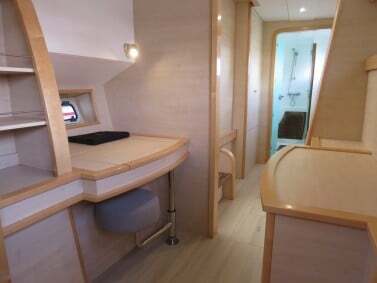 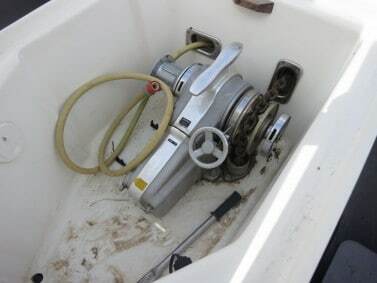 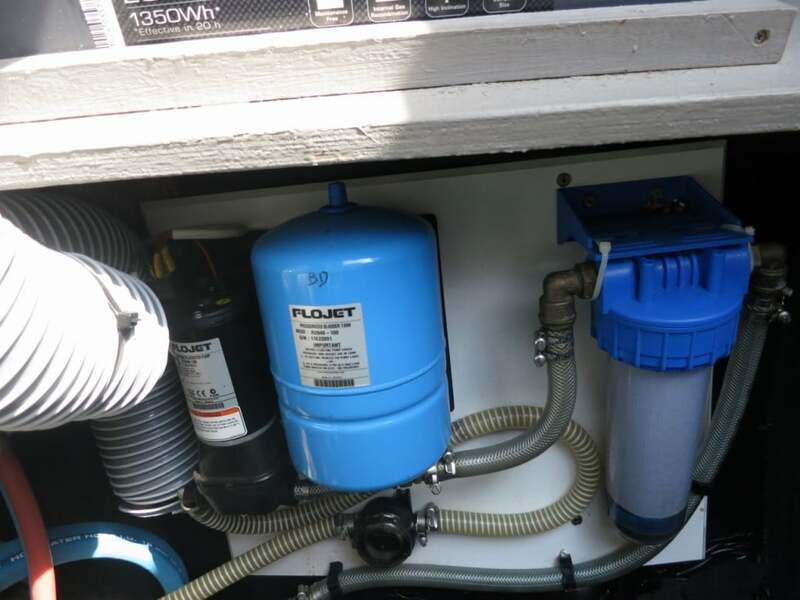 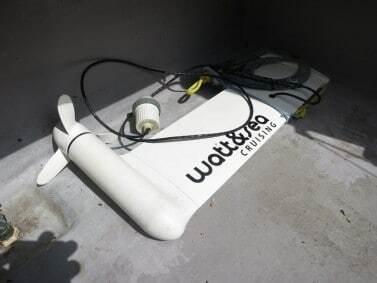 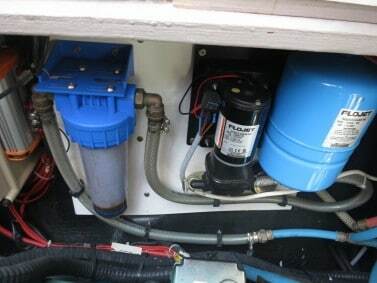 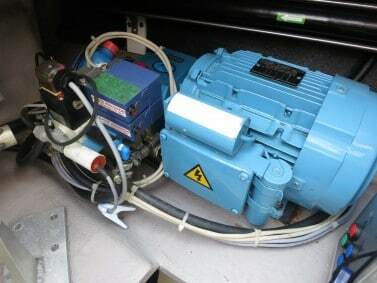 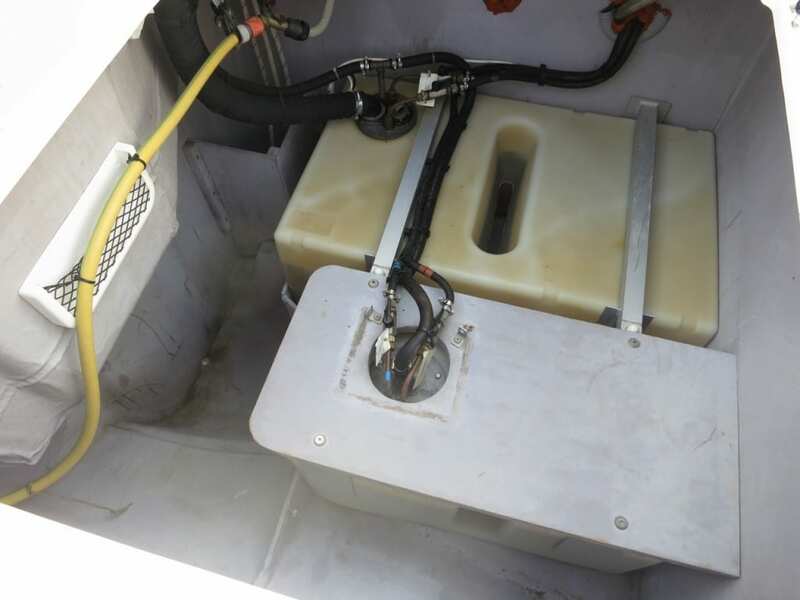 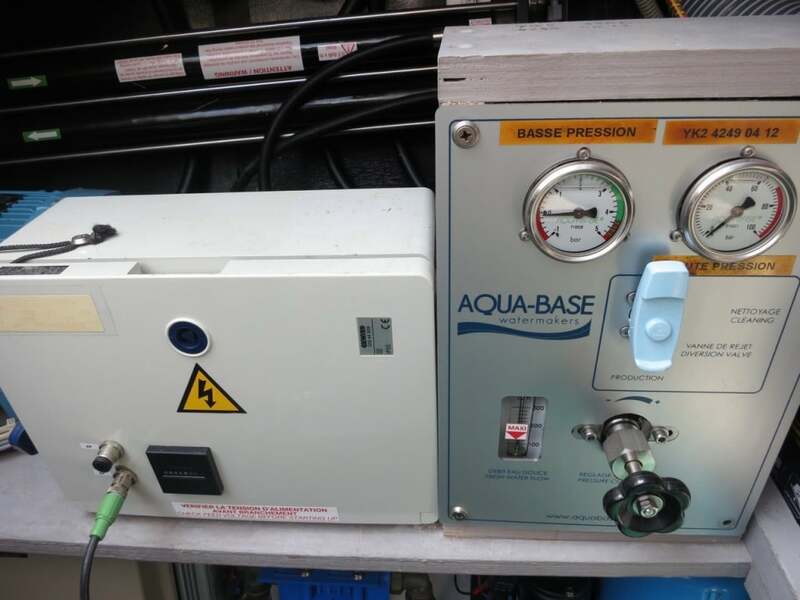 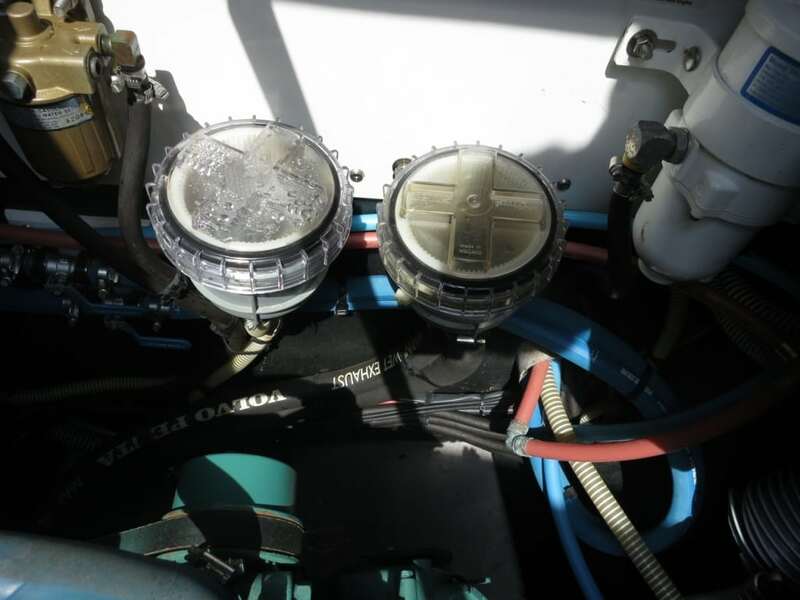 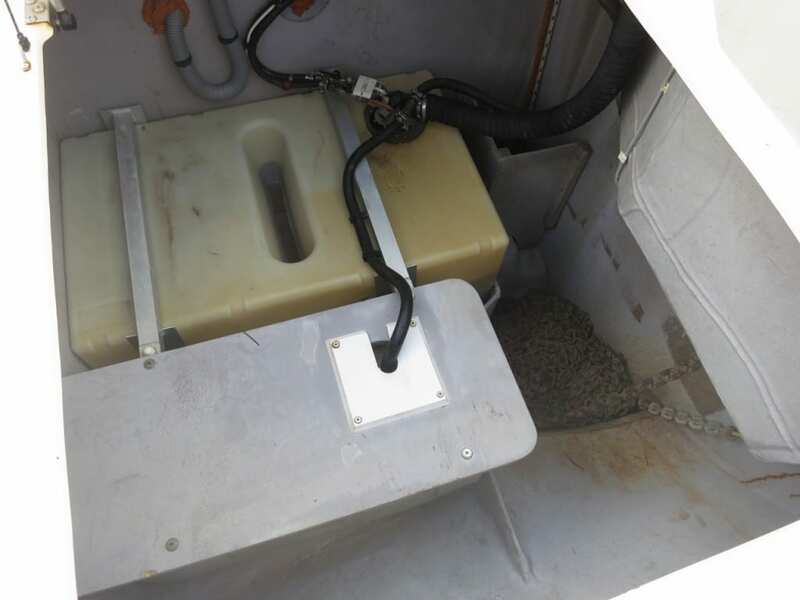 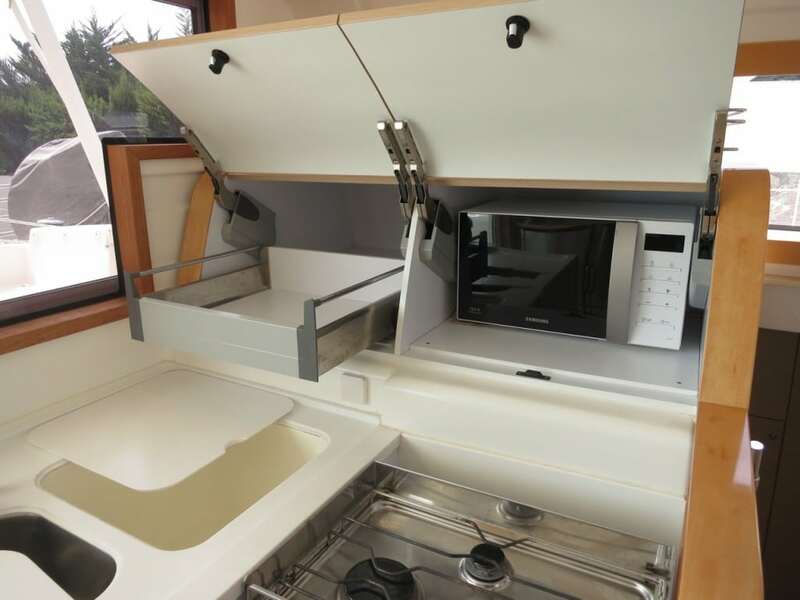 Aft is a separate water closet with a Dometic VacuFlush fresh water toilet with holding tank, macerator pump and Y-valve for overboard discharge. 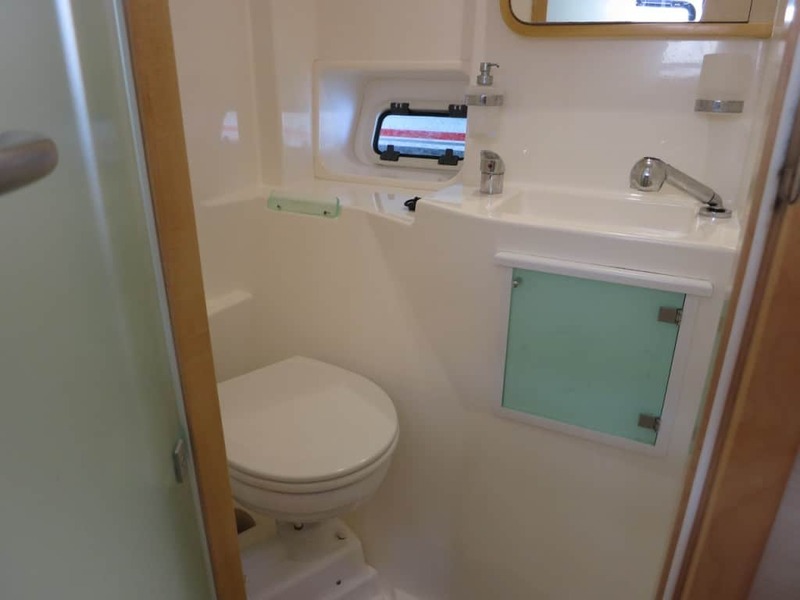 The water closet has a portlight for ventilation. 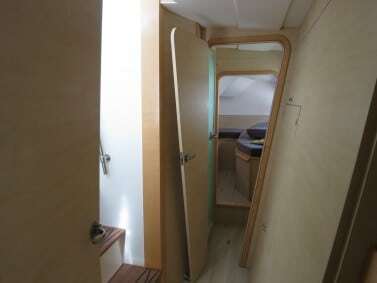 Amidships passageway has four bookshelves and a locker starboard. 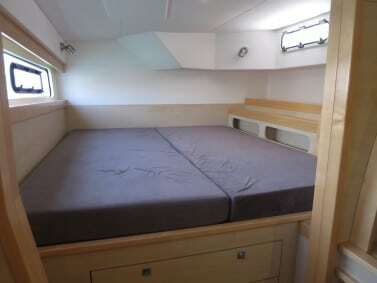 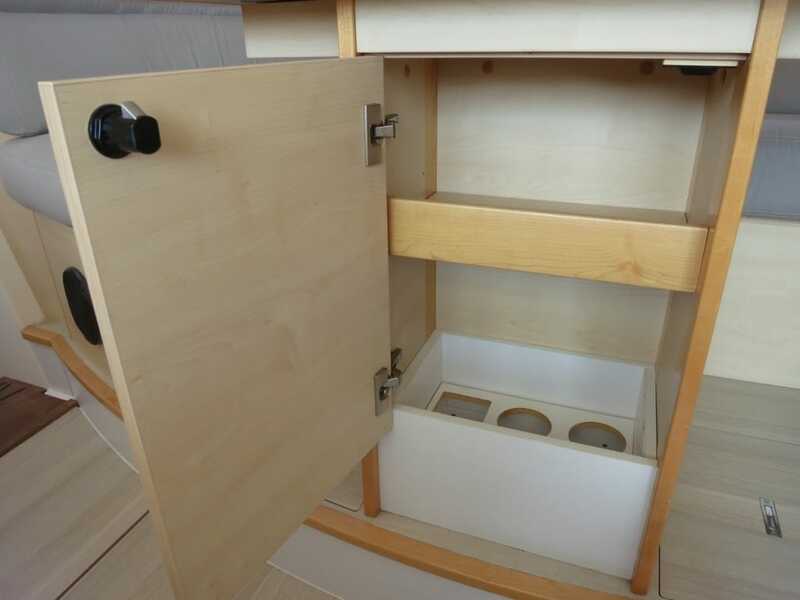 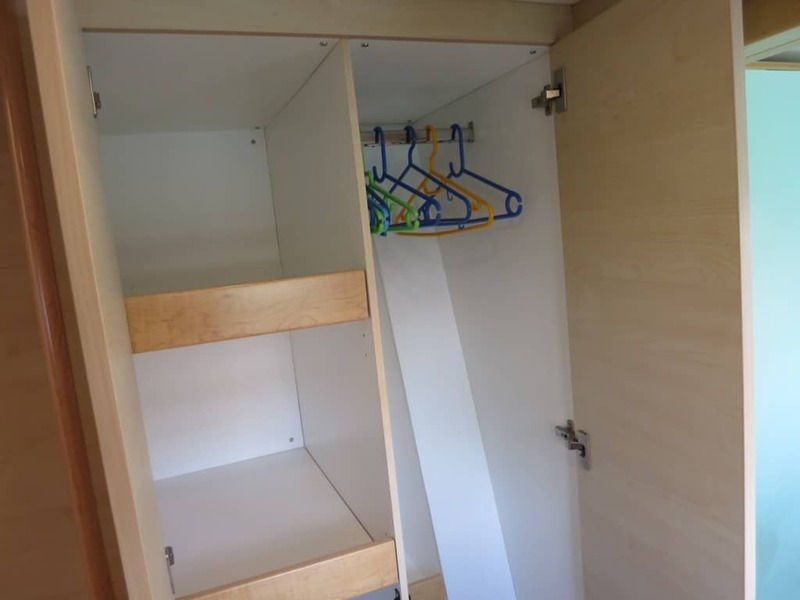 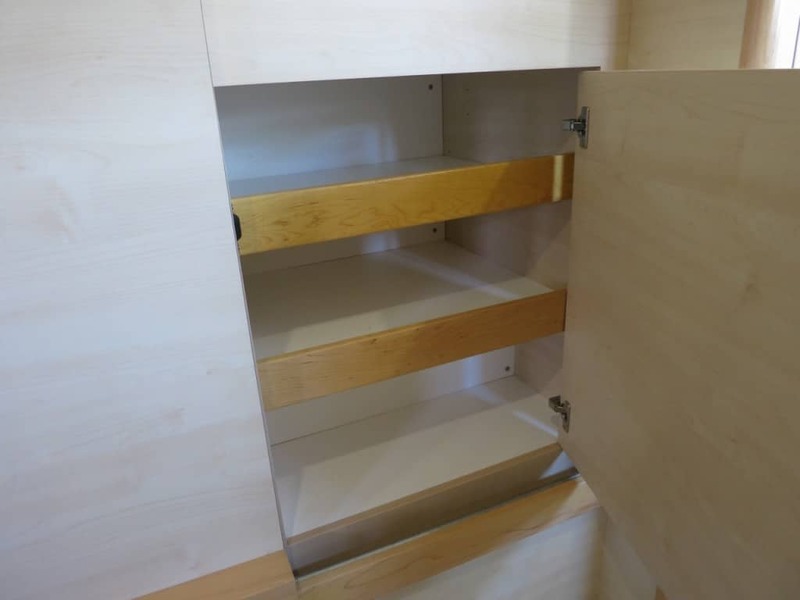 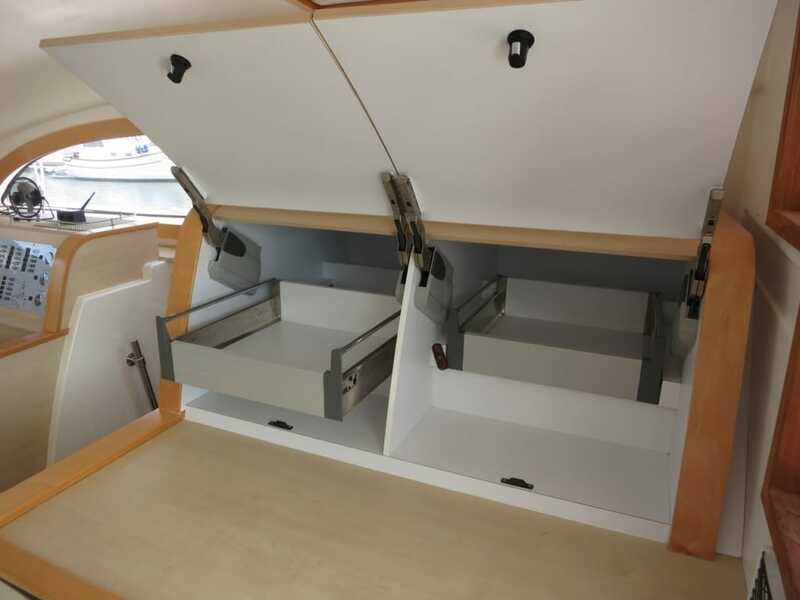 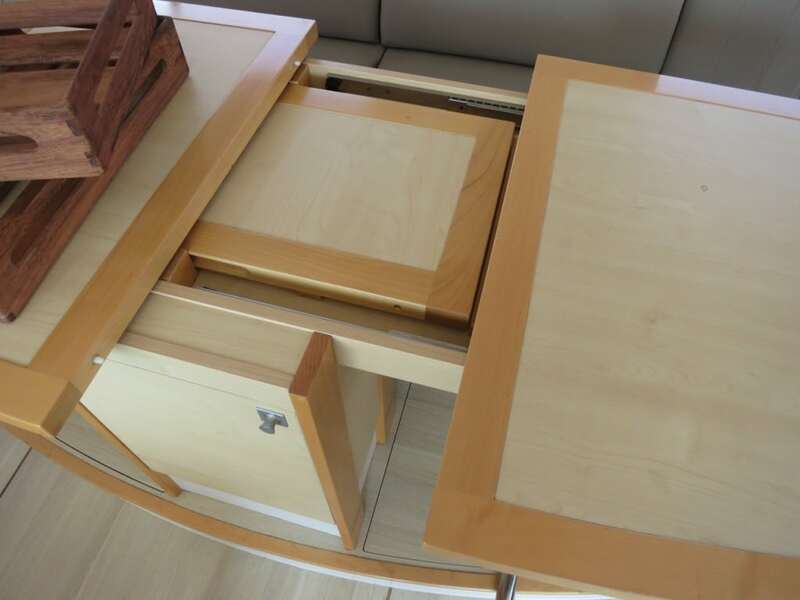 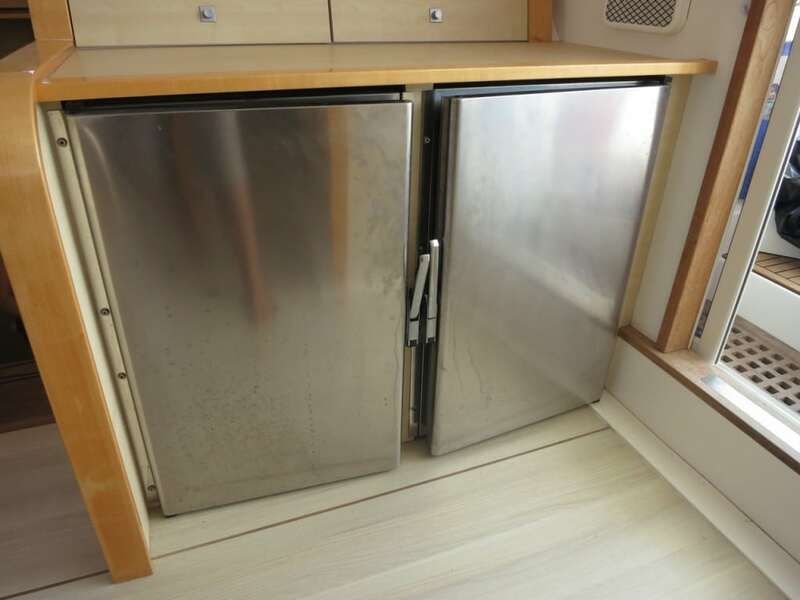 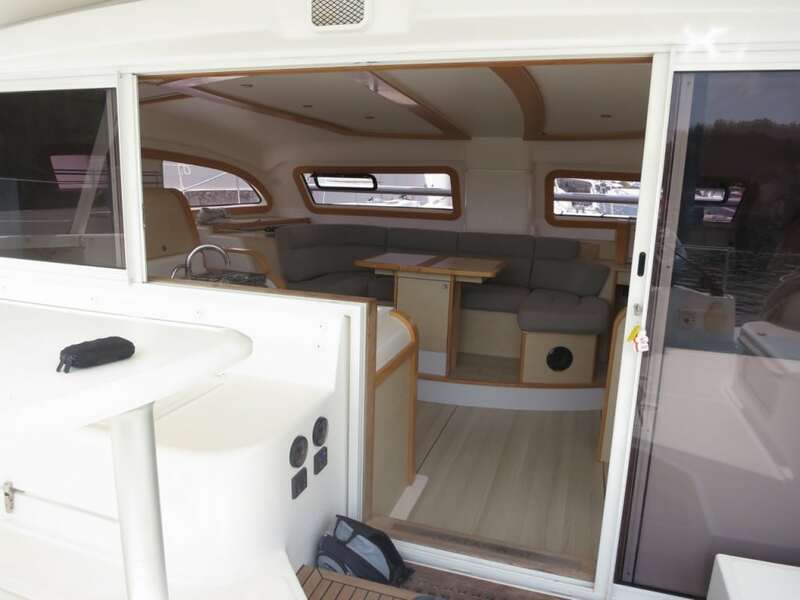 Inboard are three wardrobe lockers and companionway steps. There is a portlight for ventilation. Aft stateroom has a slated king berth with a large storage area below, a bookshelf with two lockers and entertainment center inboard. 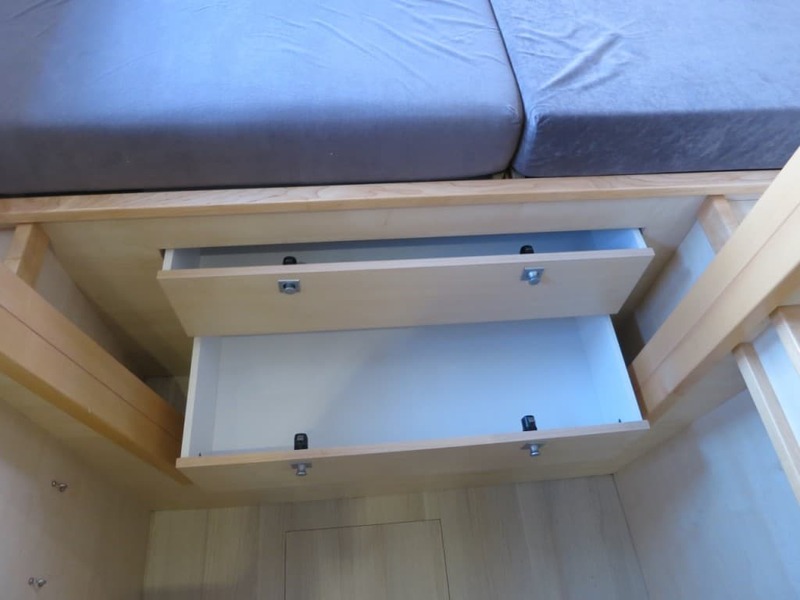 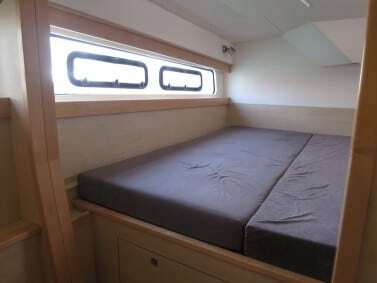 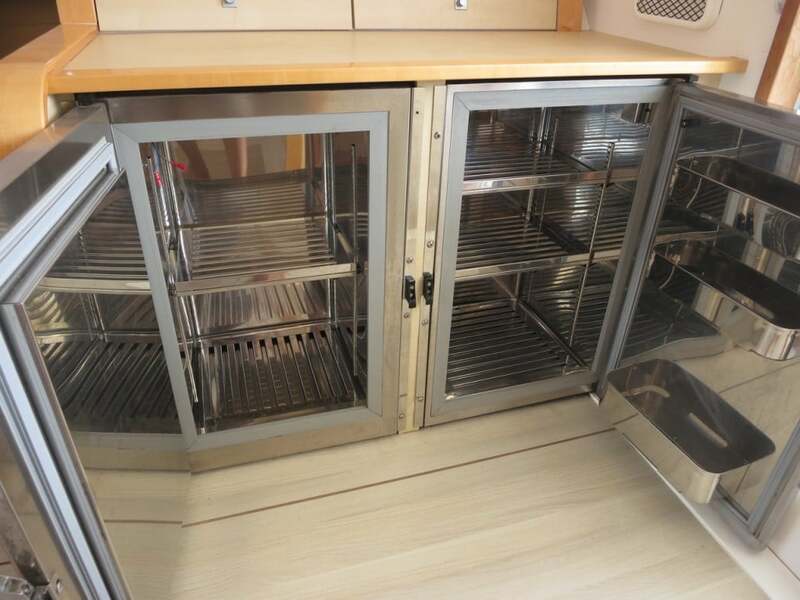 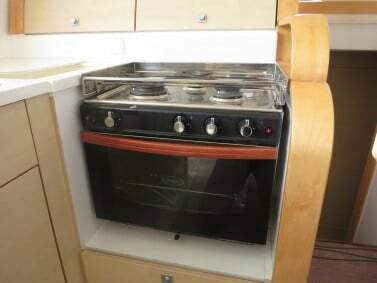 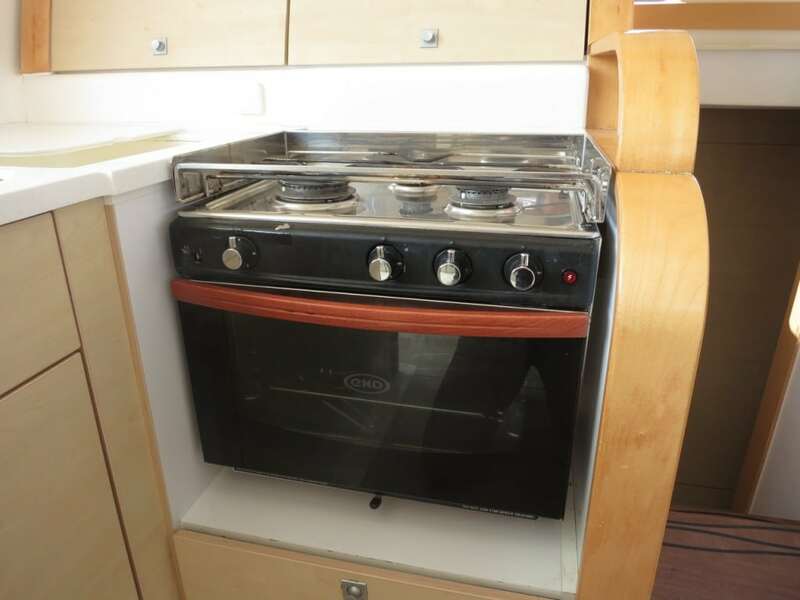 Under berth is a large drawer. 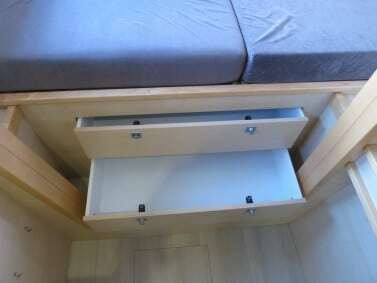 Outboard and forward of the bed is a settee with a vanity table aft and a desk forward. Inboard are two wardrobe lockers. 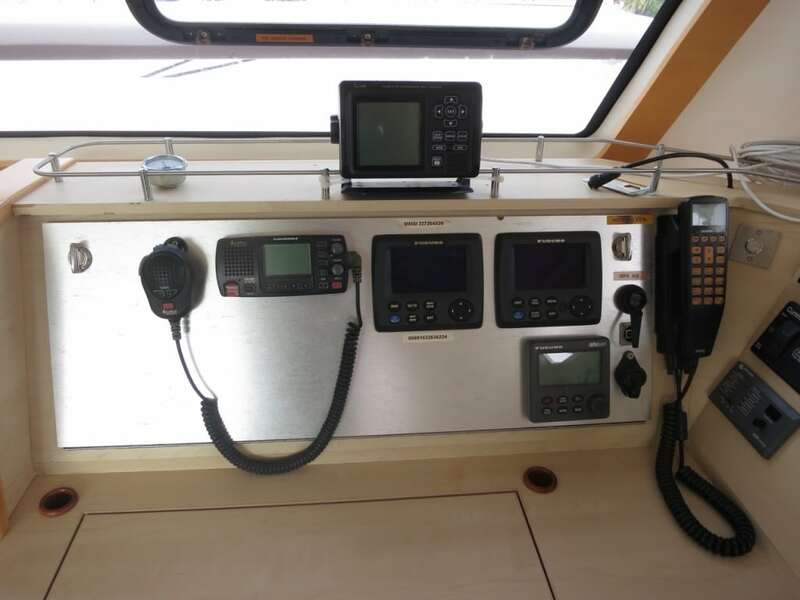 There is a large “sea-view” portlight outboard with built-in mosquito screen/sun shade and portlight inboard for cross ventilation. Forepeak has sail storage with access via a deck hatch. 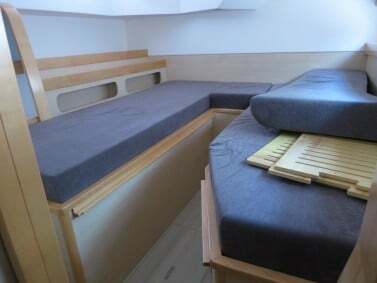 Forward stateroom has a slated double berth with large storage area below. Outboard, aft of berth, is a desk with swivel seat and wardrobe locker. 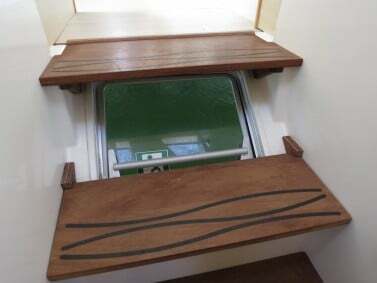 Inboard, aft of berth, are a wardrobe and a hanging locker. 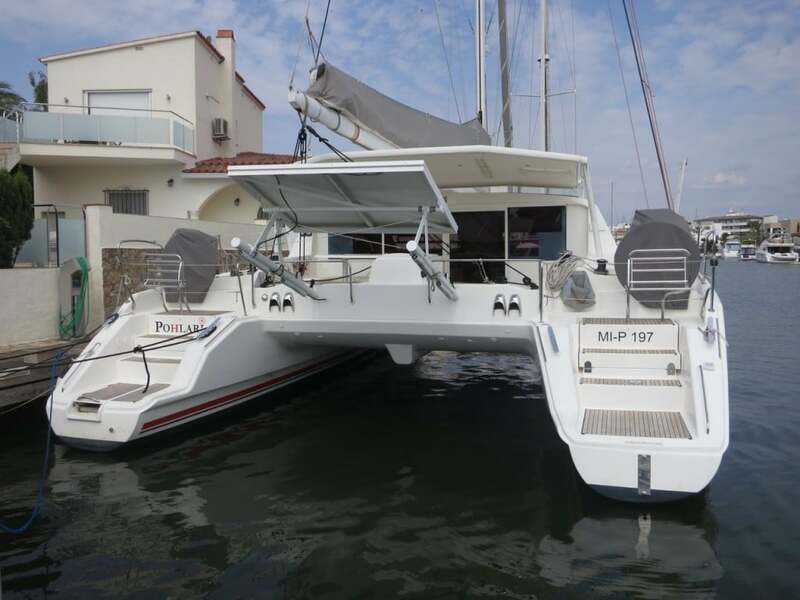 There is large “sea-view” portlight outboard with built-in mosquito screen/sun shade and an escape hatch inboard with mosquito screen/sun shade. 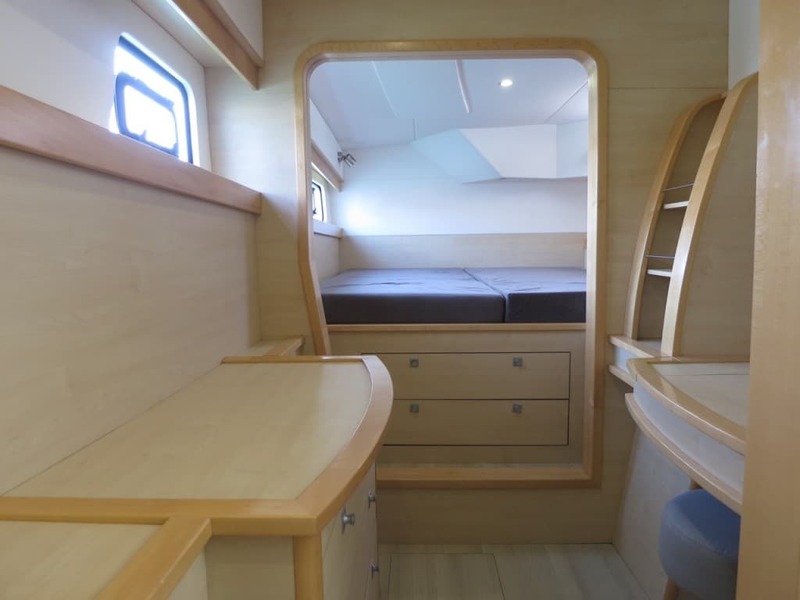 The amidships passageway has a head compartment for guests and bookshelves outboard. 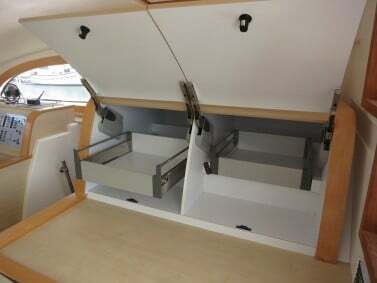 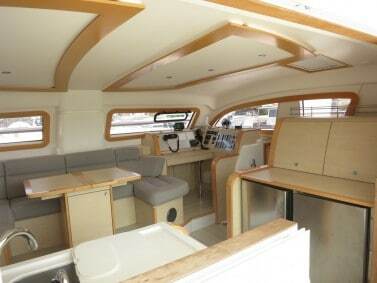 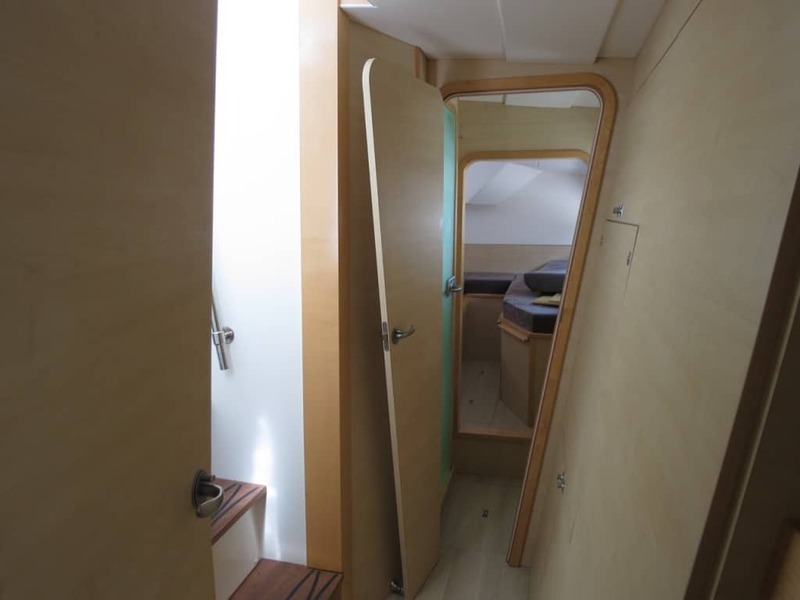 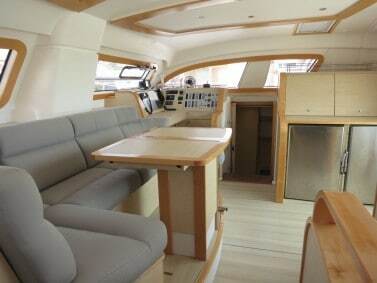 Inboard are two very large wardrobe/pantry lockers and companionway steps to the bridge deck. 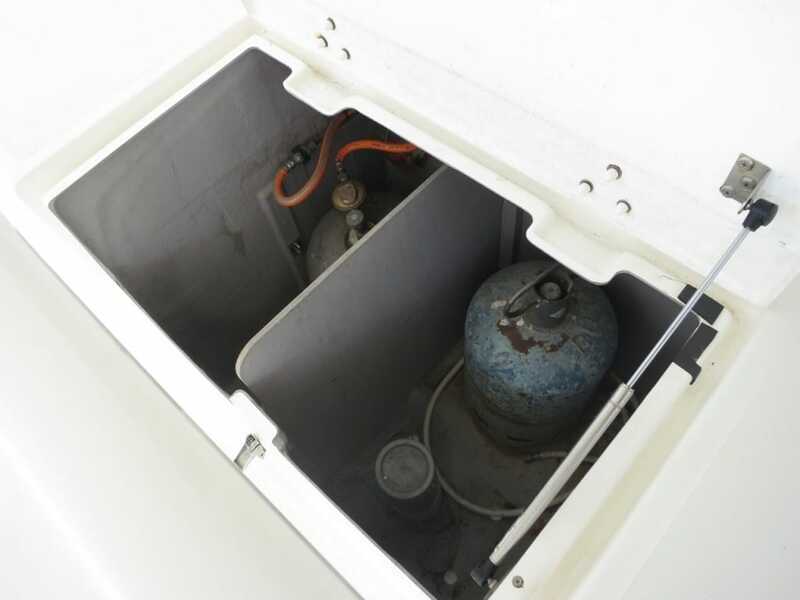 There is a portlight for ventilation. 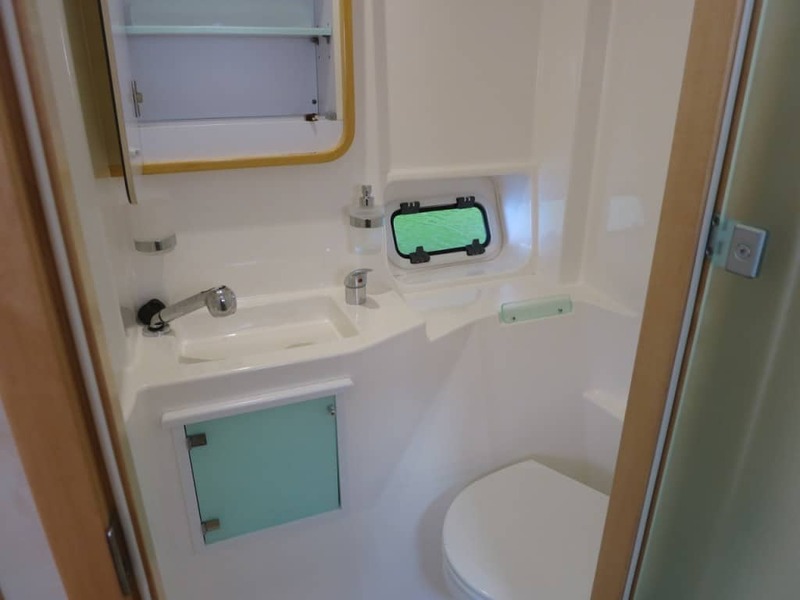 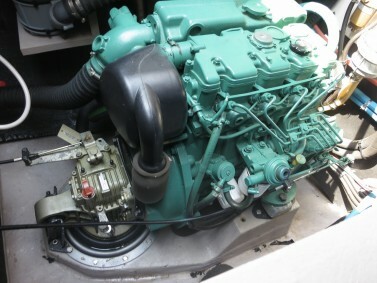 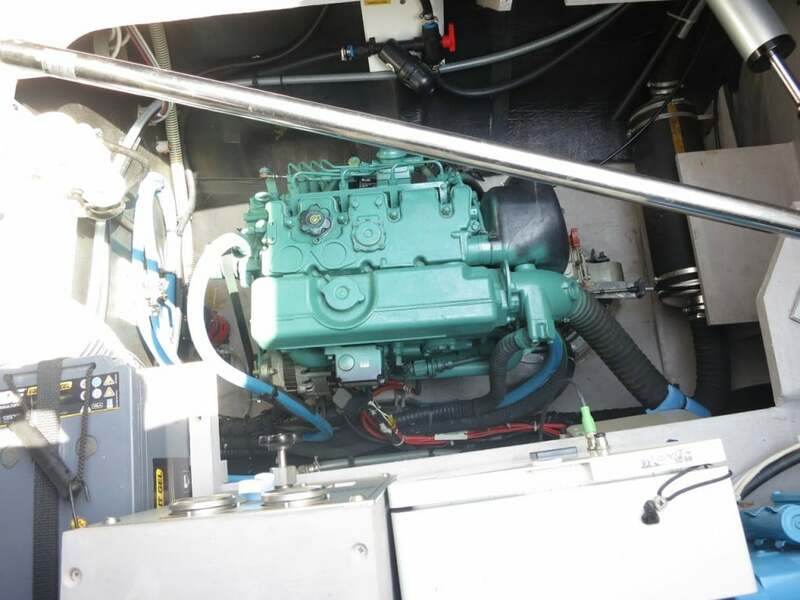 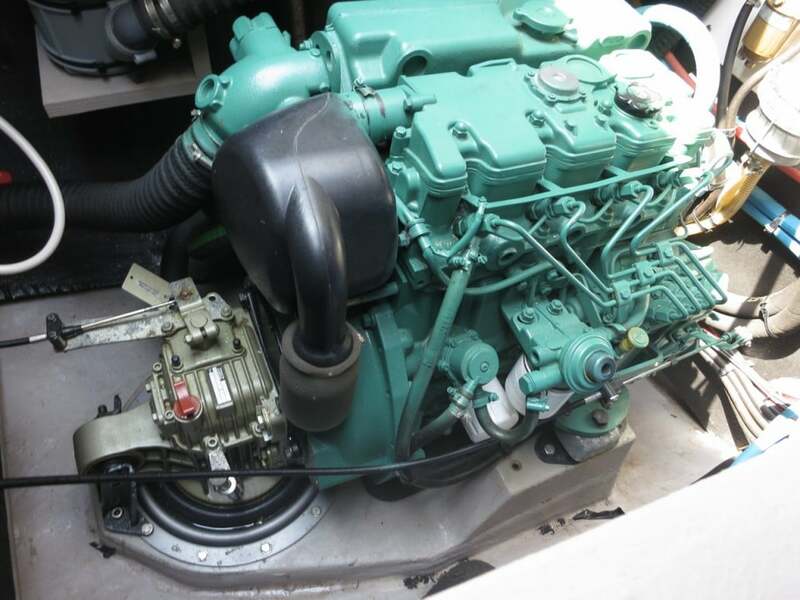 Head compartment has a Dometic VacuFlush fresh-water toilet with holding tank, macerator pump and Y-valve for overboard discharge. There is a molded vanity with countertop, hot/cold pressure water and hand-held shower with teak grate and sump pump. 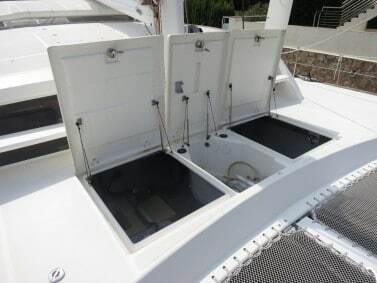 There are two portlights for ventilation. 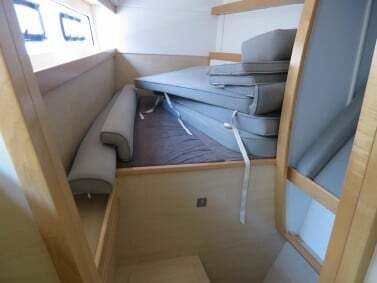 Aft stateroom has a king berth with a large storage area below and bookshelf inboard. 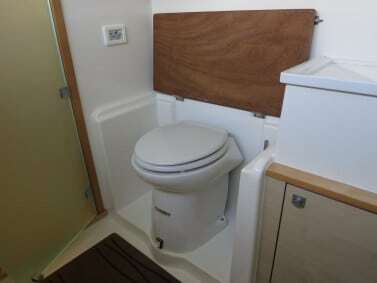 Outboard at the foot of the berth is a dressing seat with two wardrobe lockers above. 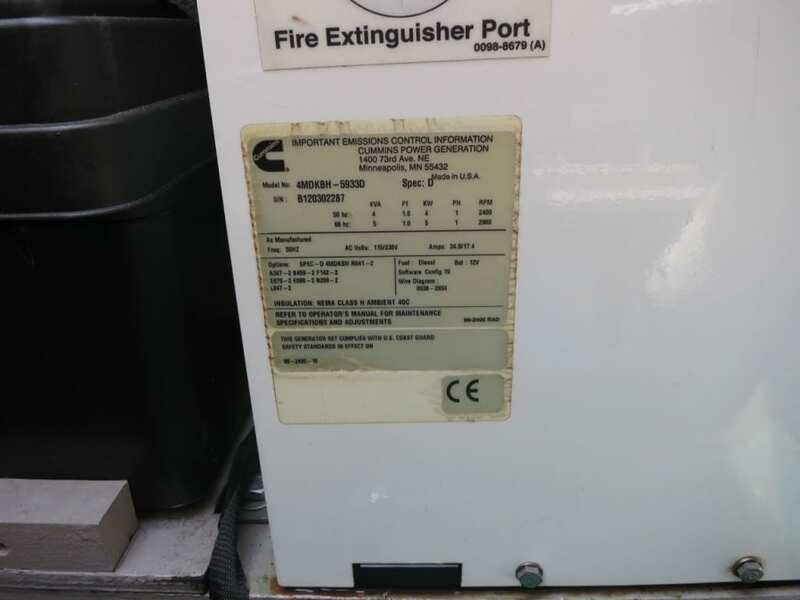 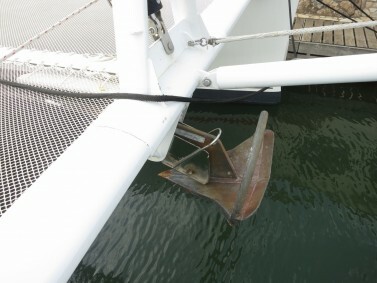 Inboard forward hanging locker. 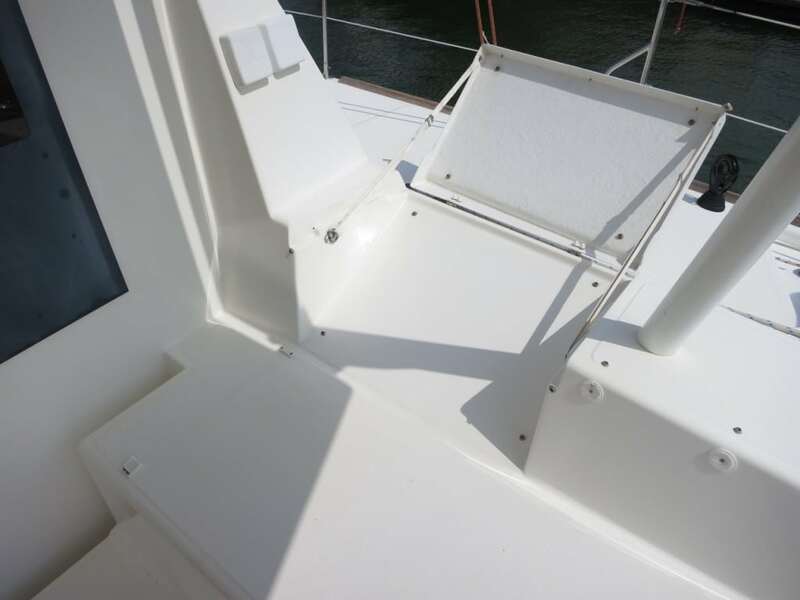 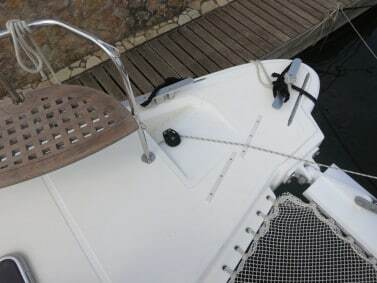 There is a large “sea-view” portlight outboard with built-in mosquito screen/sun shade and a smaller portlight inboard for cross ventilation.